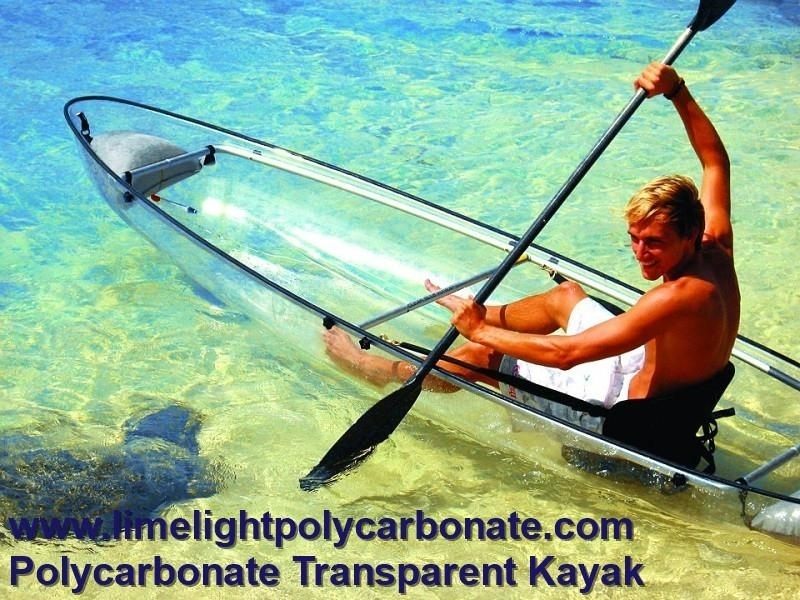 Clear kayak, transparent kayak, crystal kayak, polycarbonate kayak, PC kayak, unbreakable plastic kayak, see bottom kayak, see through kayak, glass kayak, fiberglass kayak, clear canoe, transparent canoe, see bottom canoe, see through canoe, crystal canoe, glass canoe, fiberglass canoe, clear boat, transparent boat, see through boat, see bottom boat, crystal boat, glass boat, fiberglass boat, see through boat, see bottom boat, clear blue kayak, clear blue canoe, clear blue boat, clear bottom kayak, clear bottom canoe, clear bottom boat, polycarbonate canoe, PC canoe, unbreakable plastic canoe, polycarbonate boat, PC boat, unbreakable plastic boat, unbreakable clear kayak, unbreakable clear canoe, sport kayak, sport canoe, fish kayak, fish canoe, sport boat, fish boat, race boat, race kayak, race canoe, tour kayak, tour canoe, tour boat, ocean kayak, ocean canoe, ocean boat, kayak paddling, canoe paddling, boat paddling, water sport kayak, water sport canoe, clear PC kayak, clear PC canoe, clear polycarbonate kayak, clear polycarbonate canoe, transparent polycarbonate kayak, transparent canoe, kayak adventure, canoe adventure, clear blue Hawaii kayak, Molokini kayak, bullet proof see through kayak, etc. 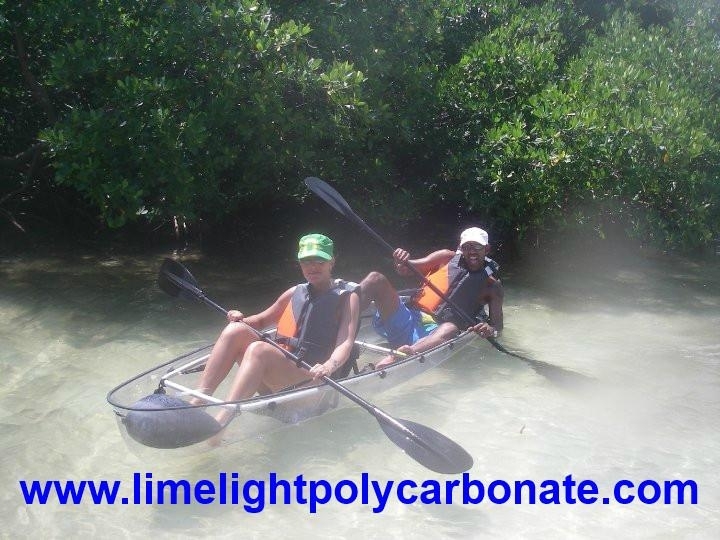 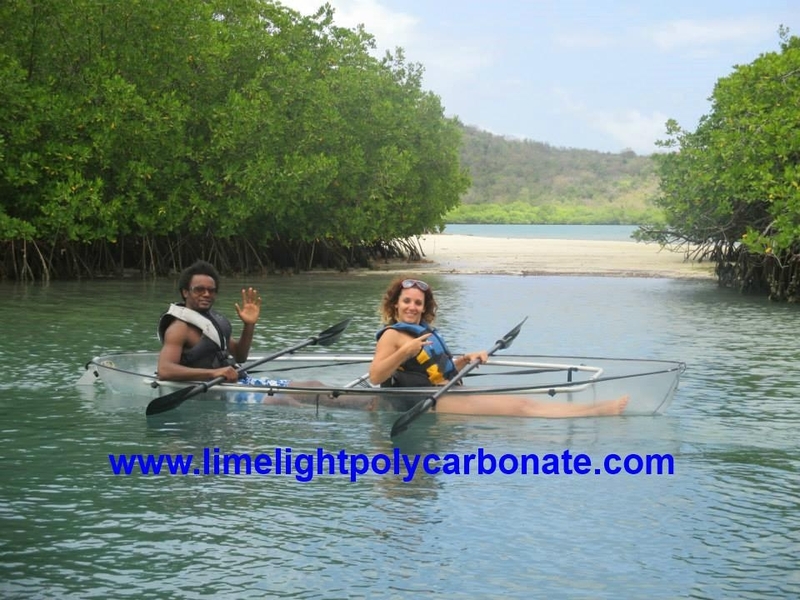 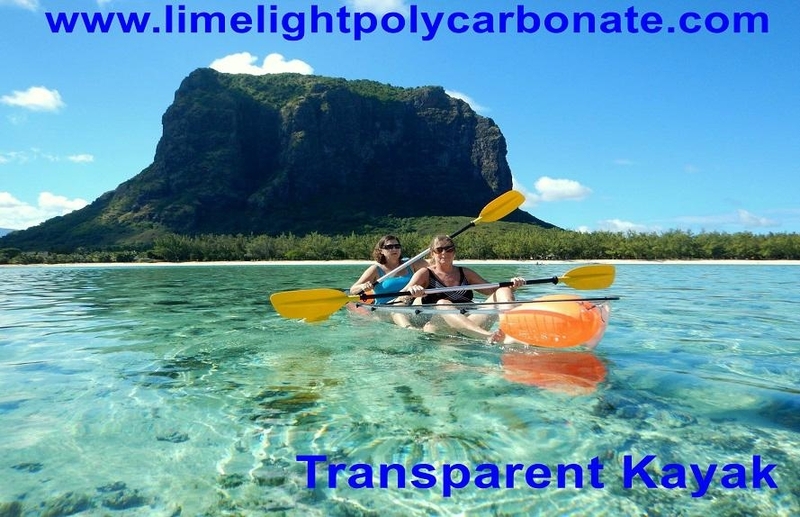 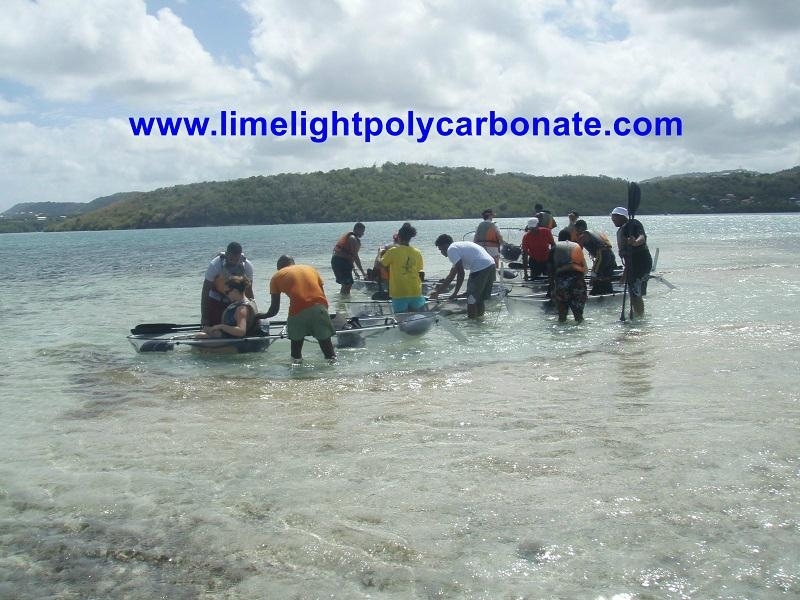 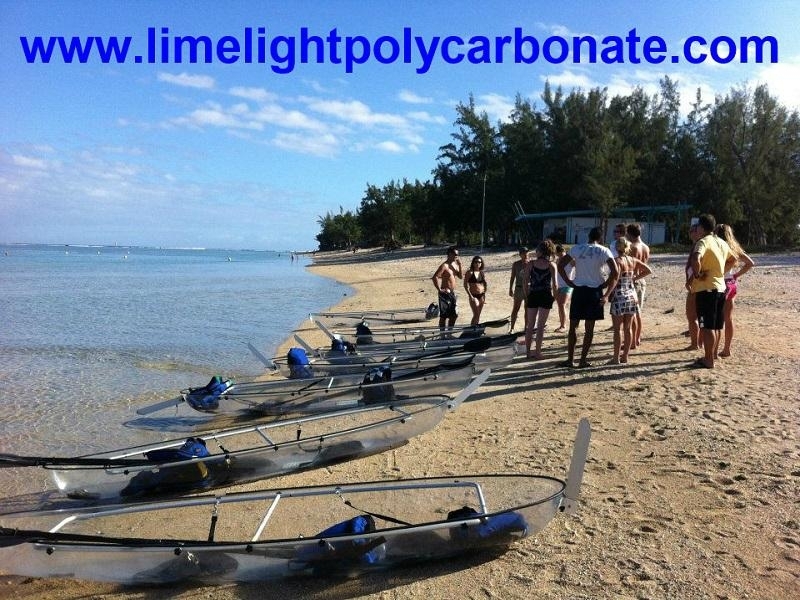 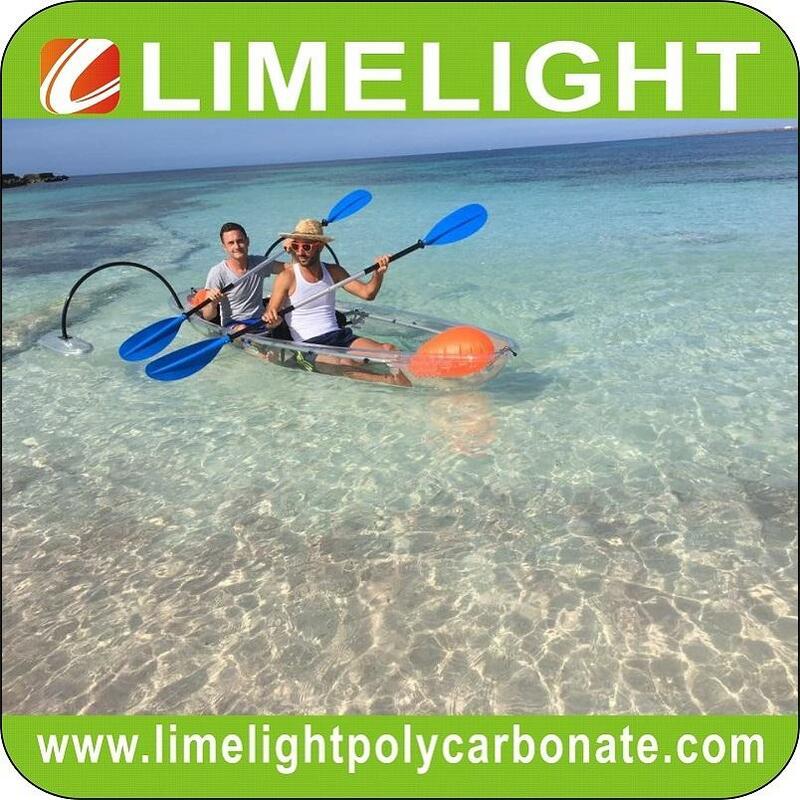 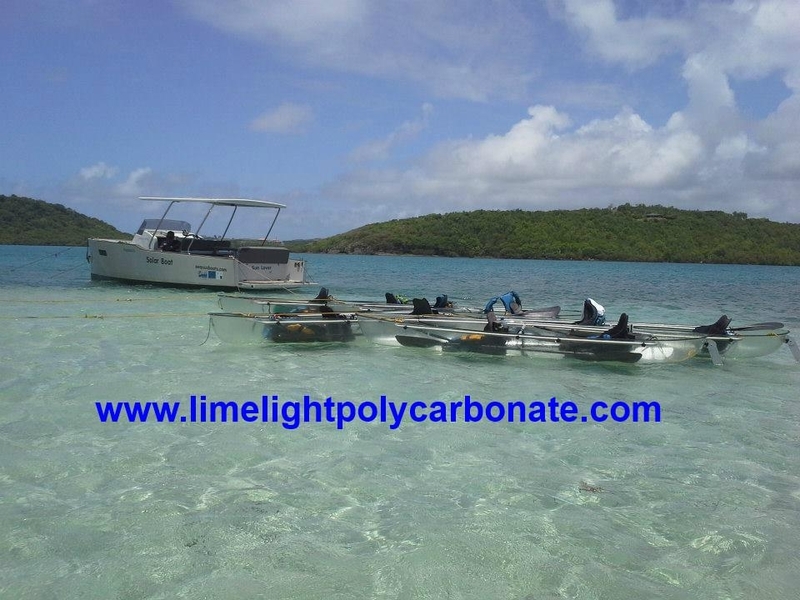 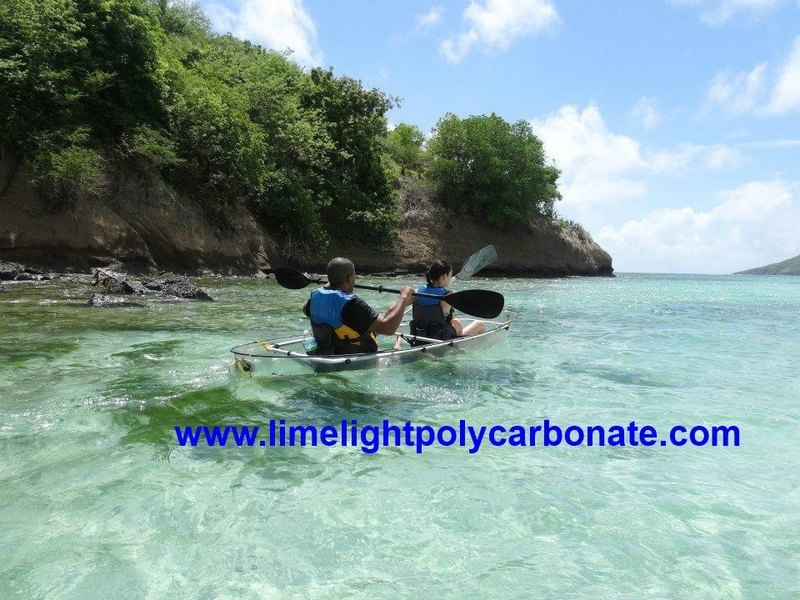 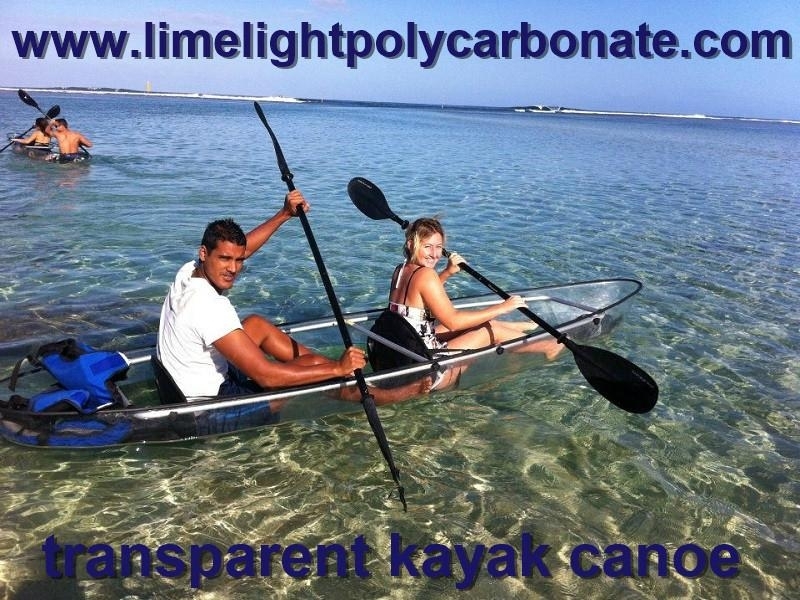 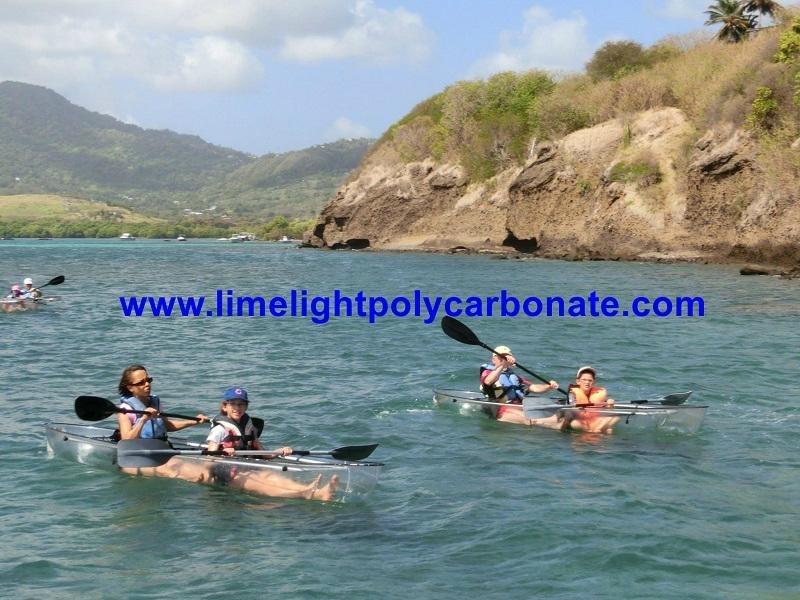 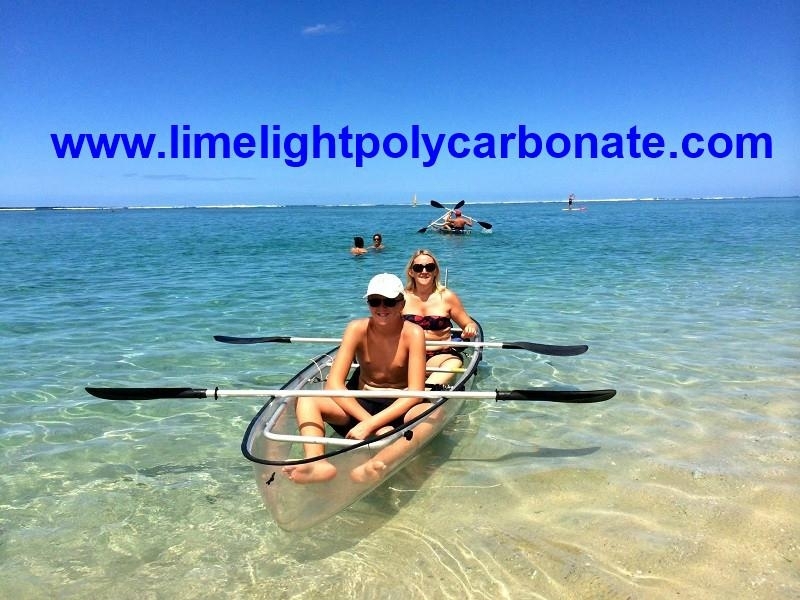 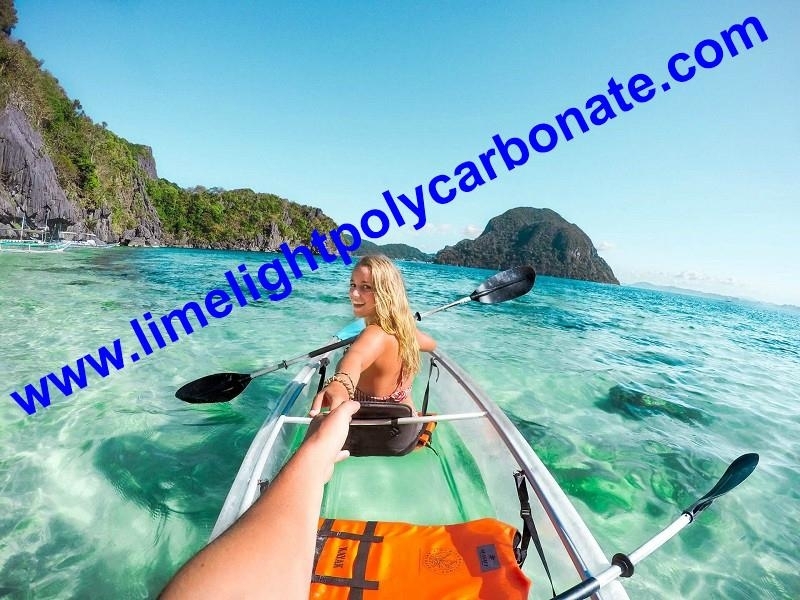 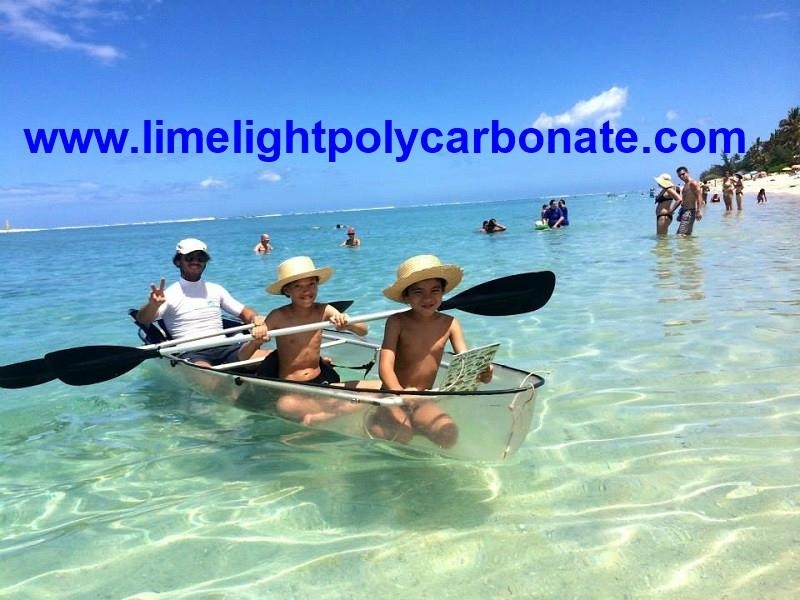 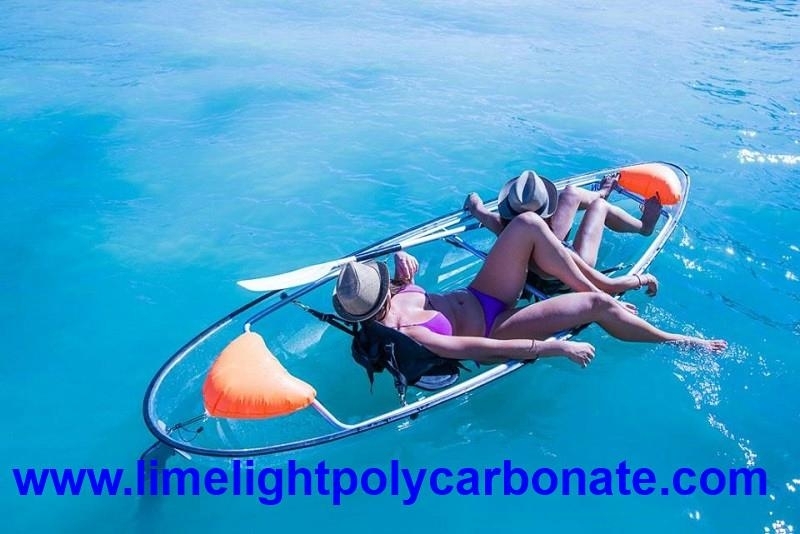 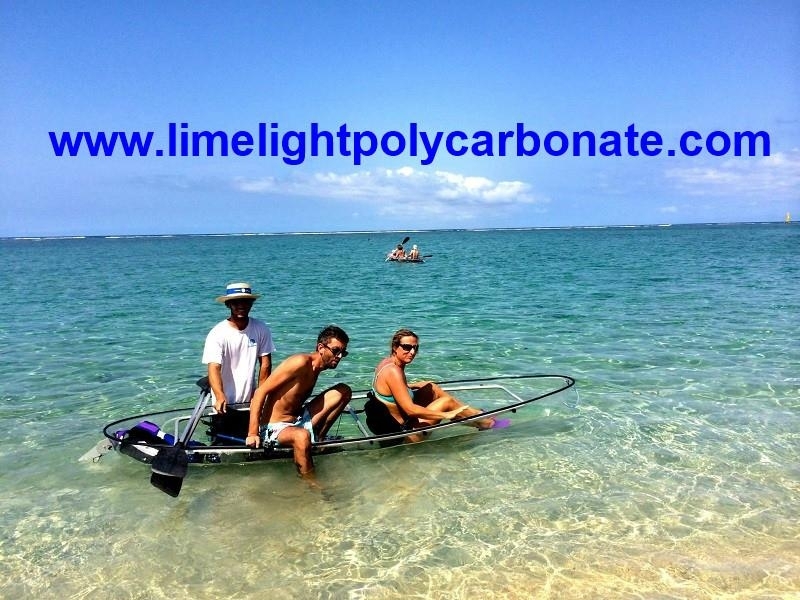 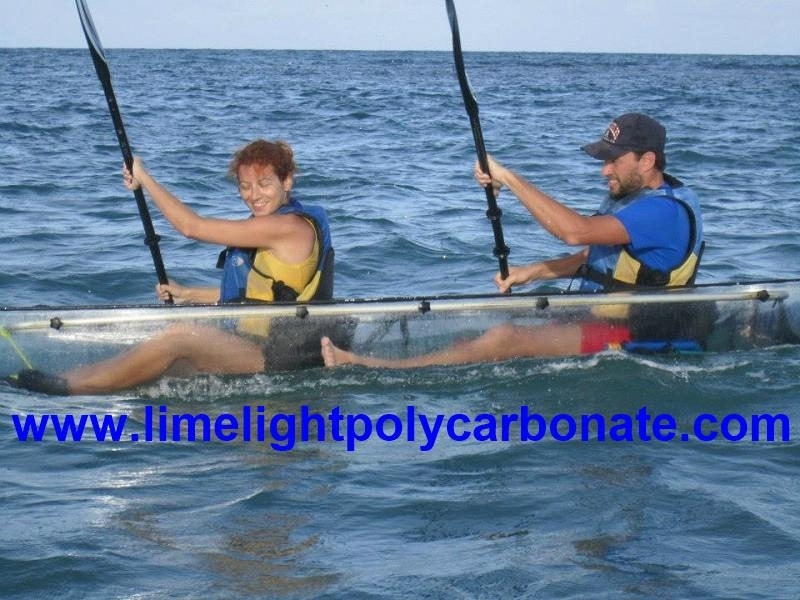 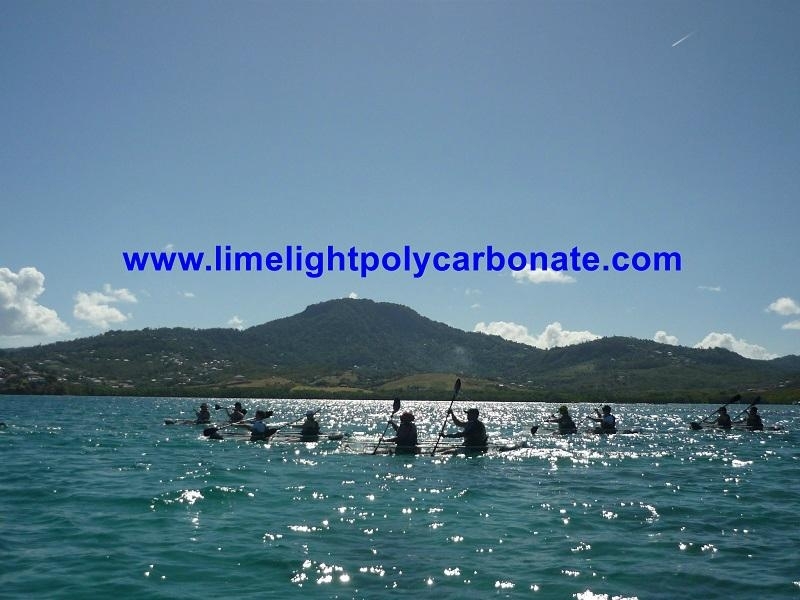 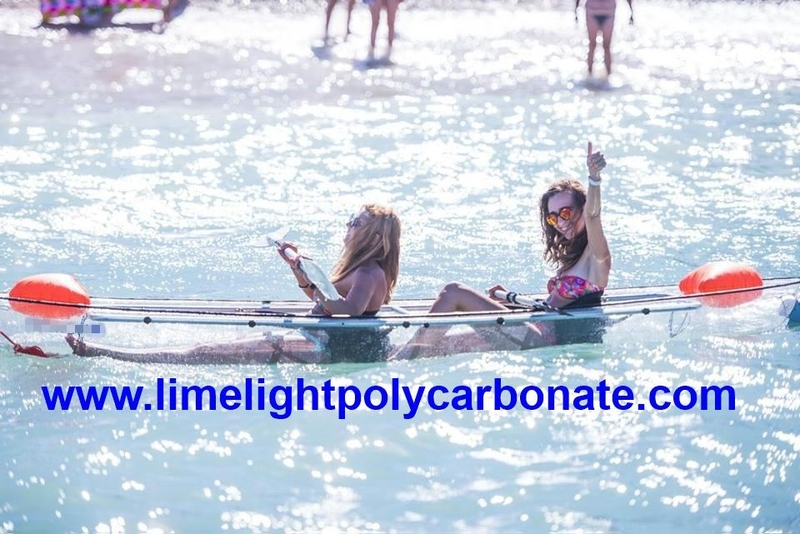 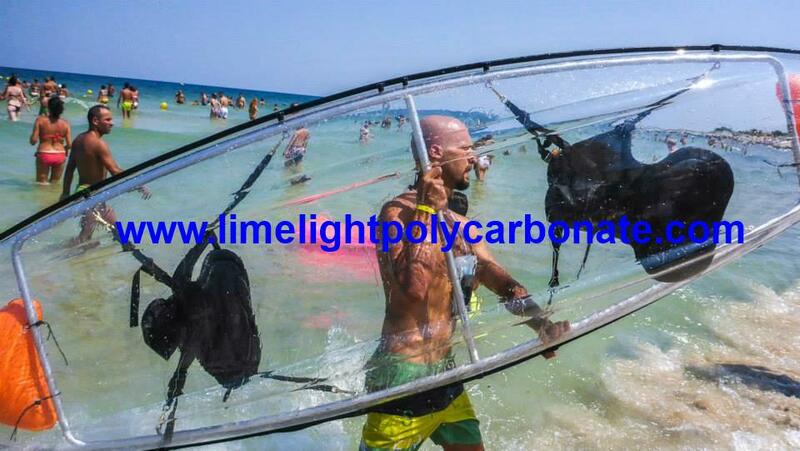 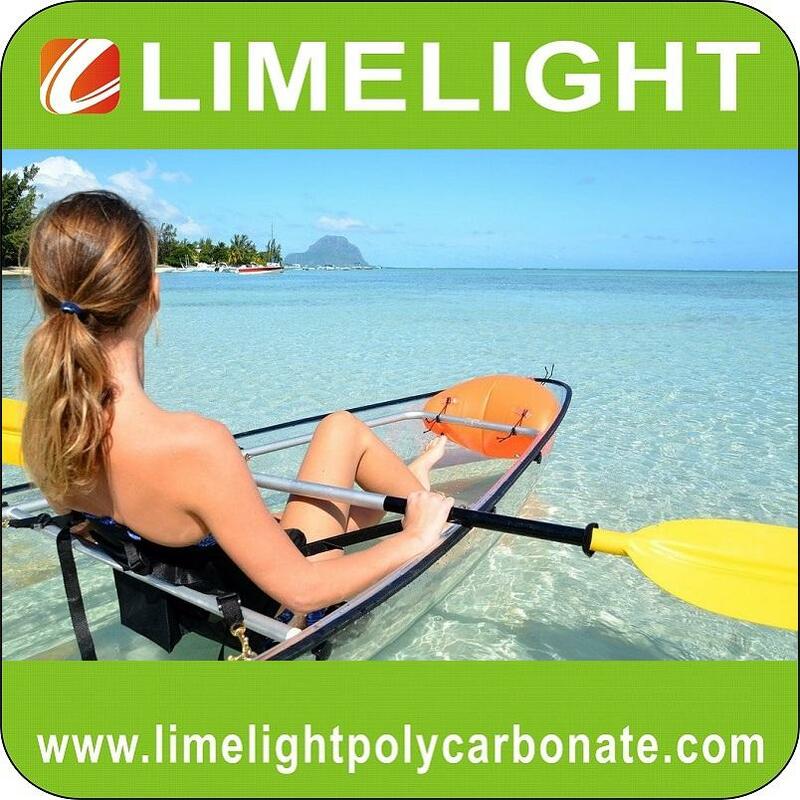 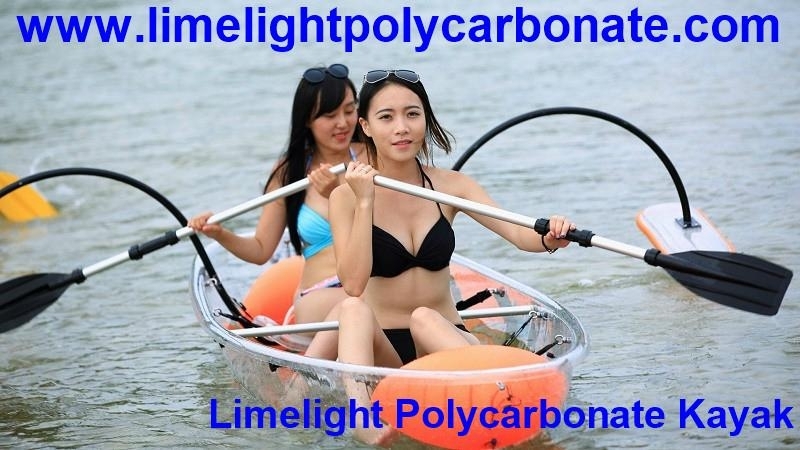 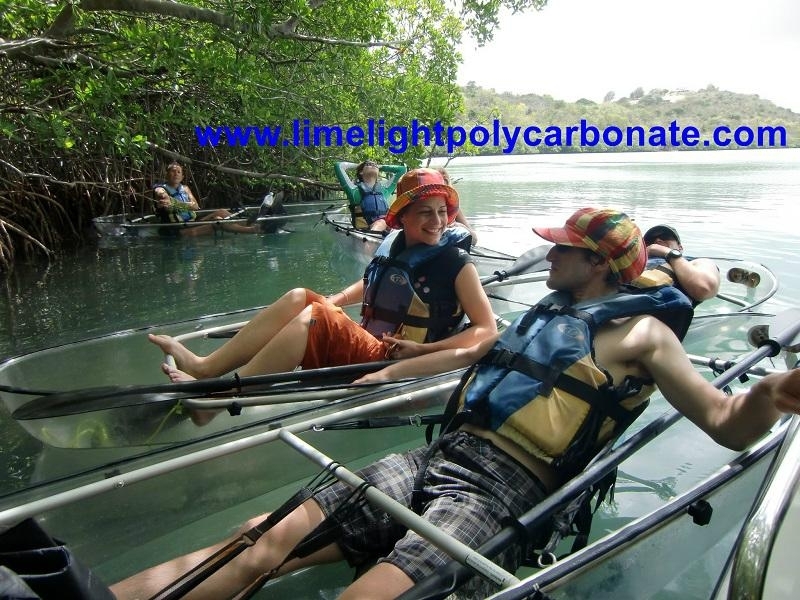 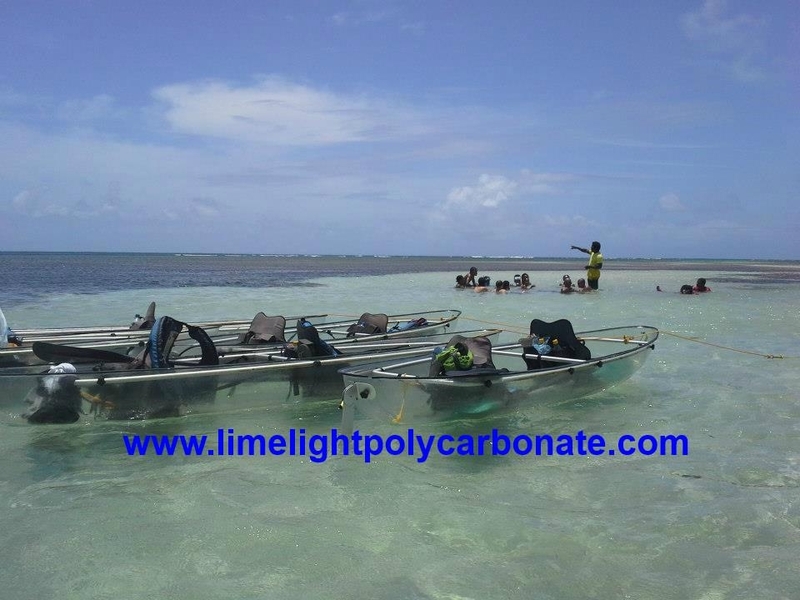 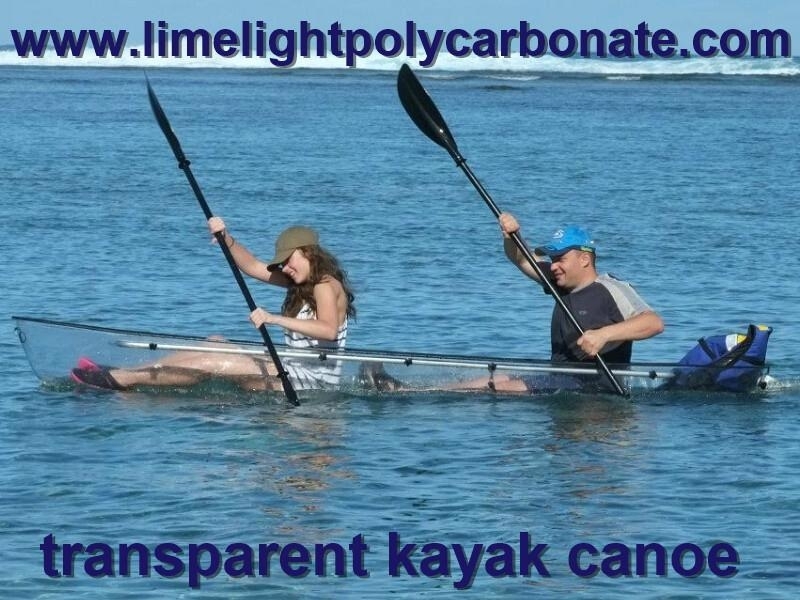 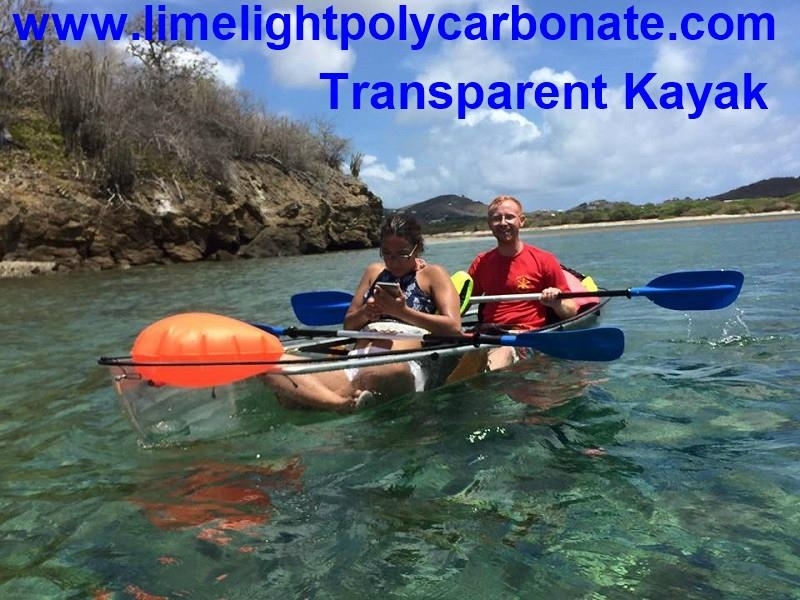 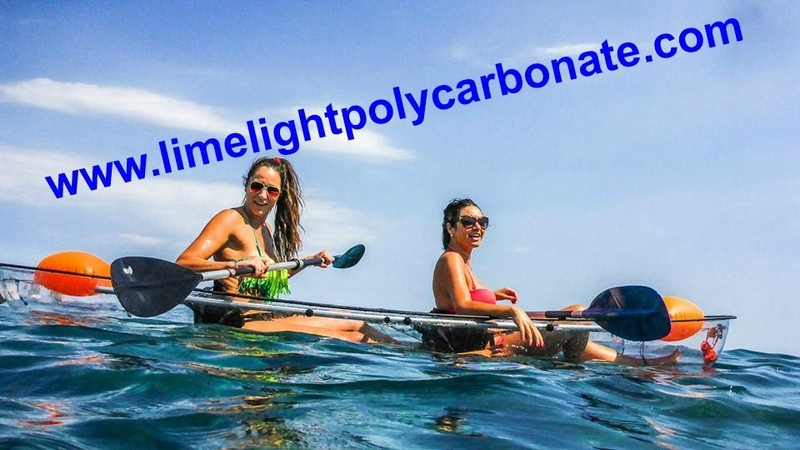 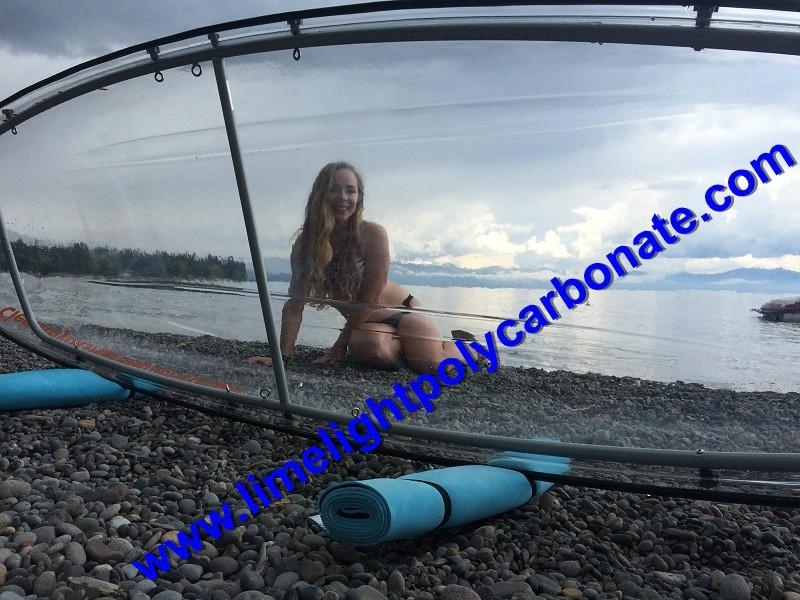 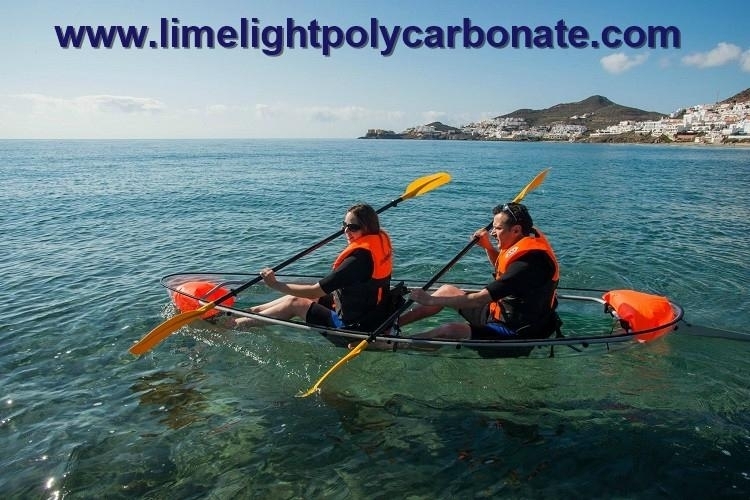 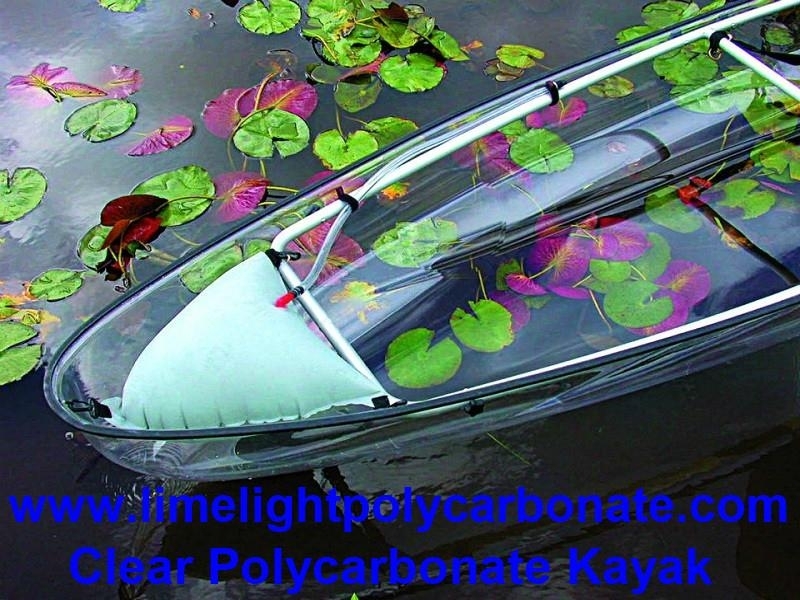 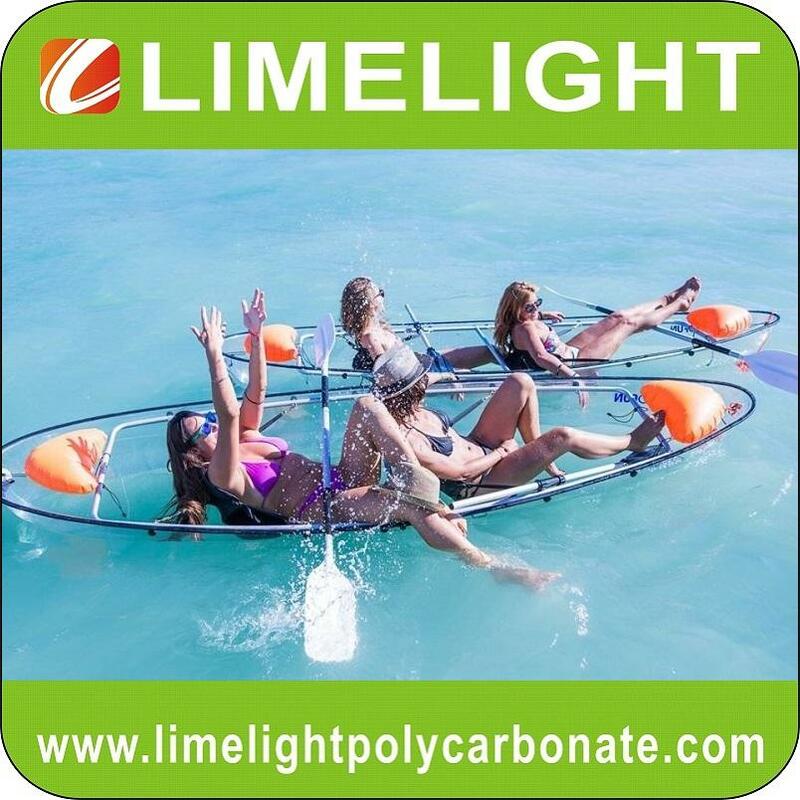 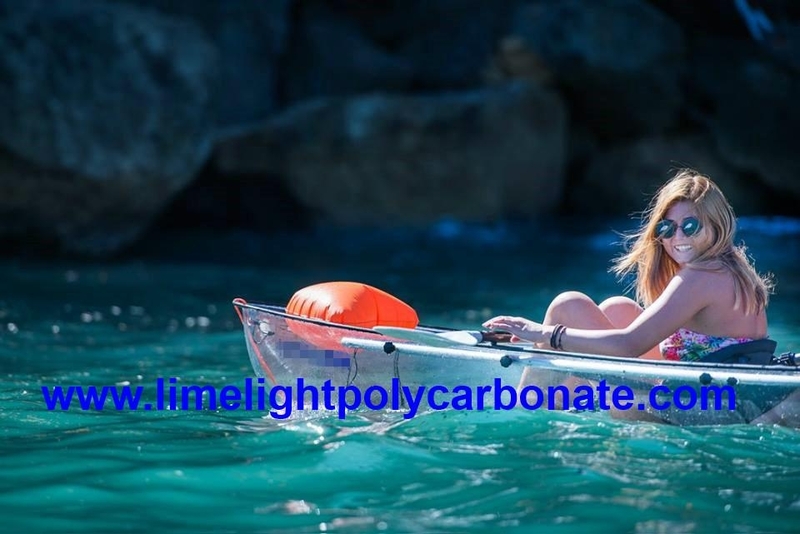 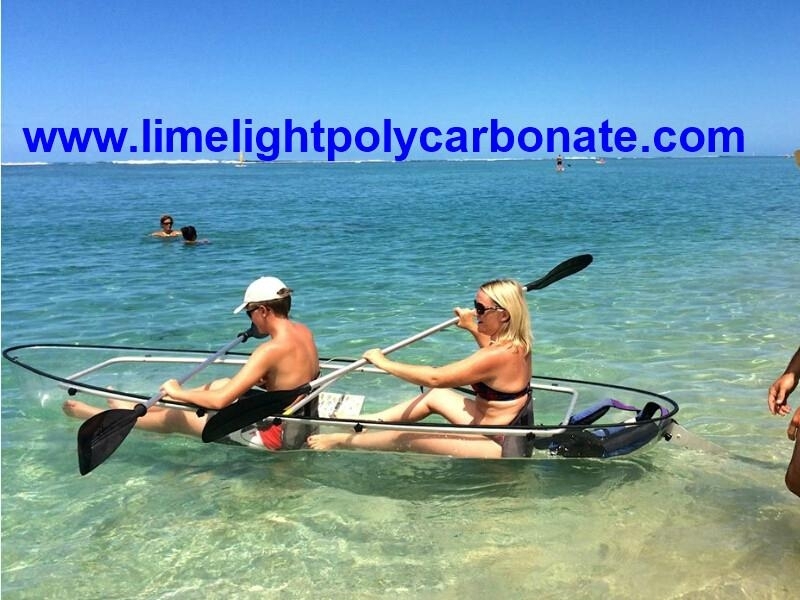 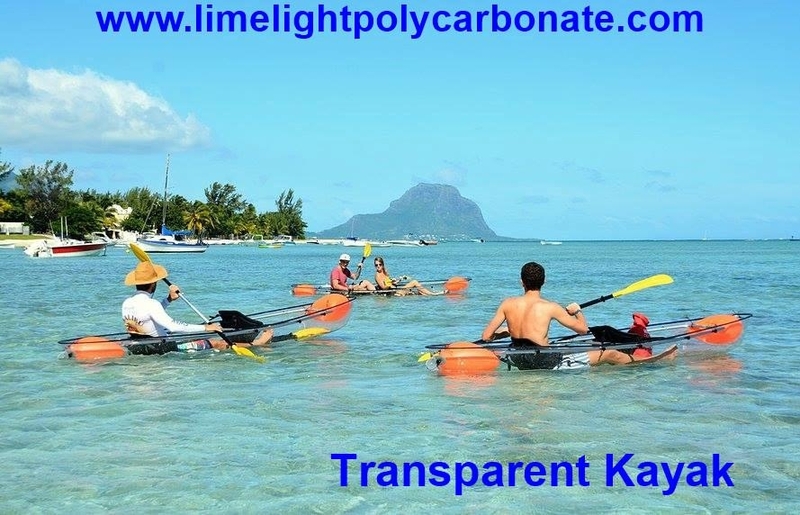 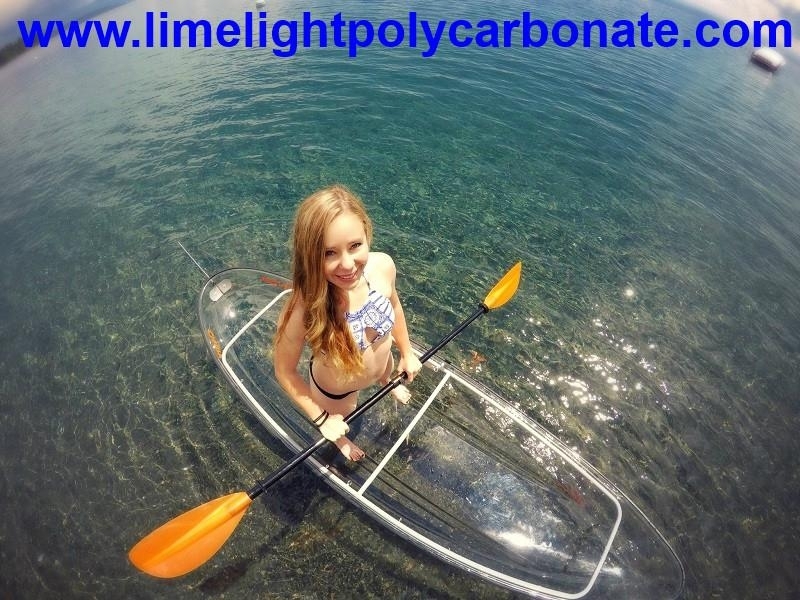 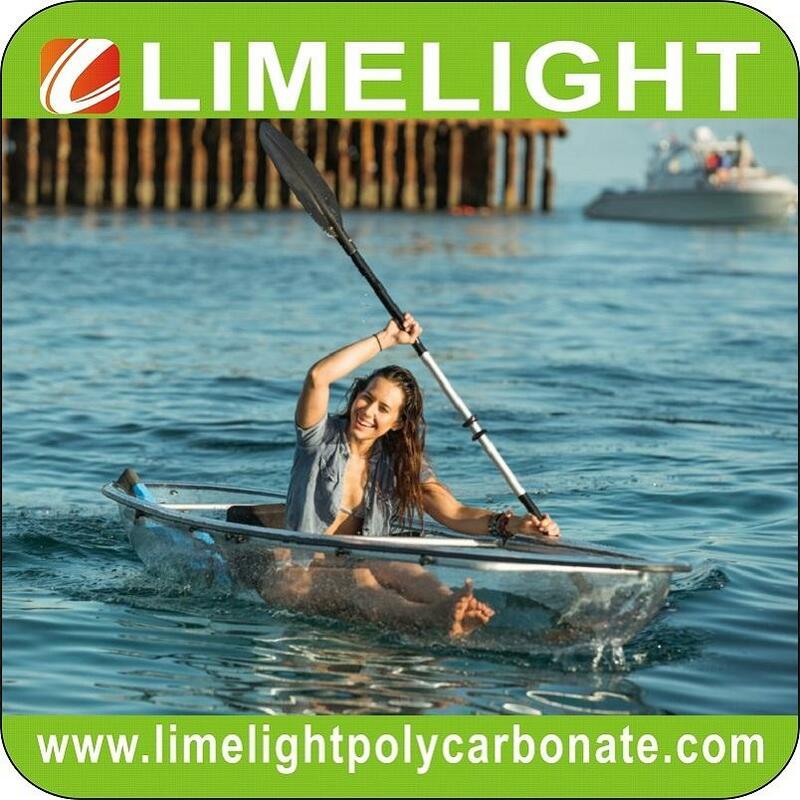 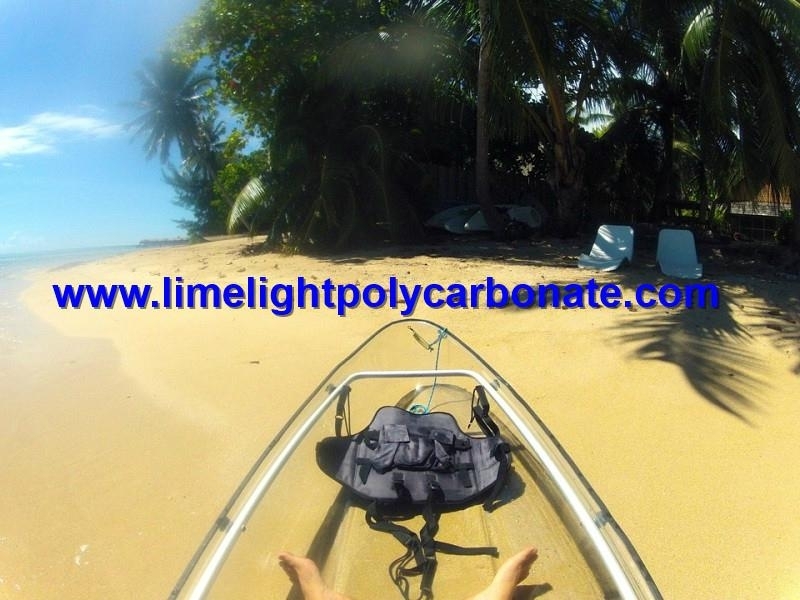 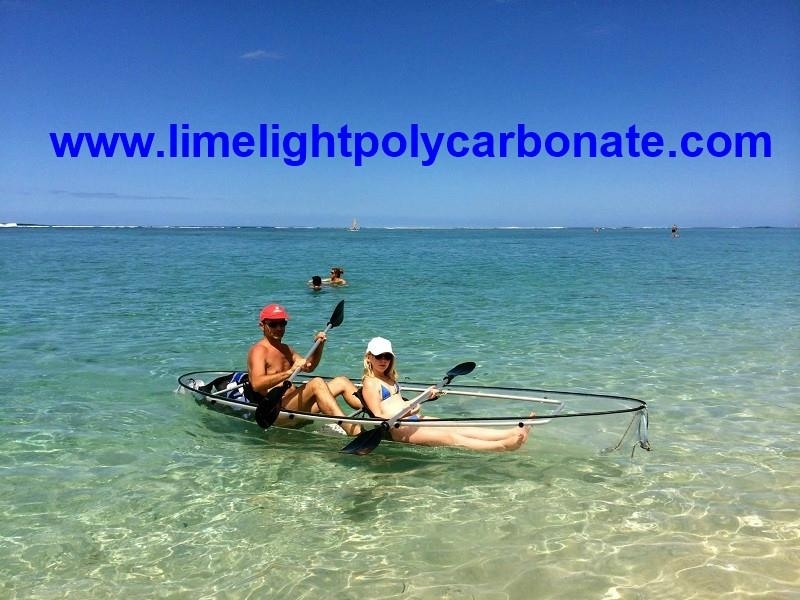 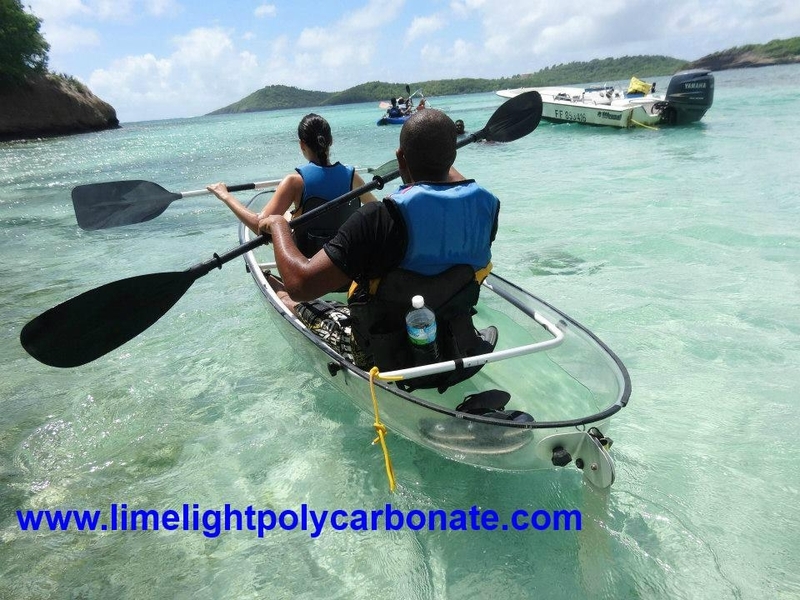 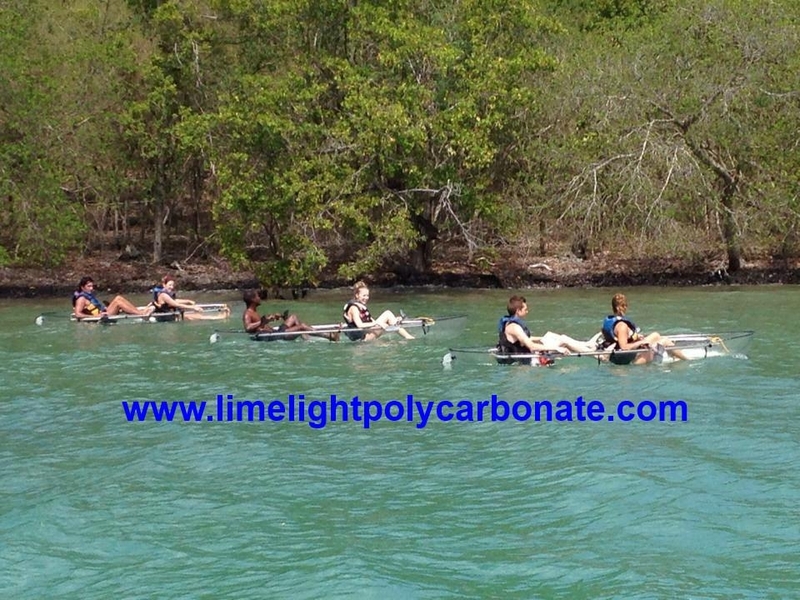 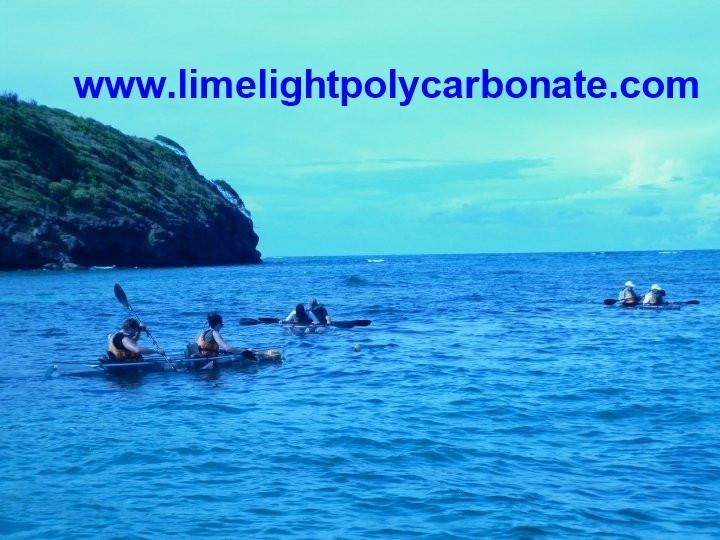 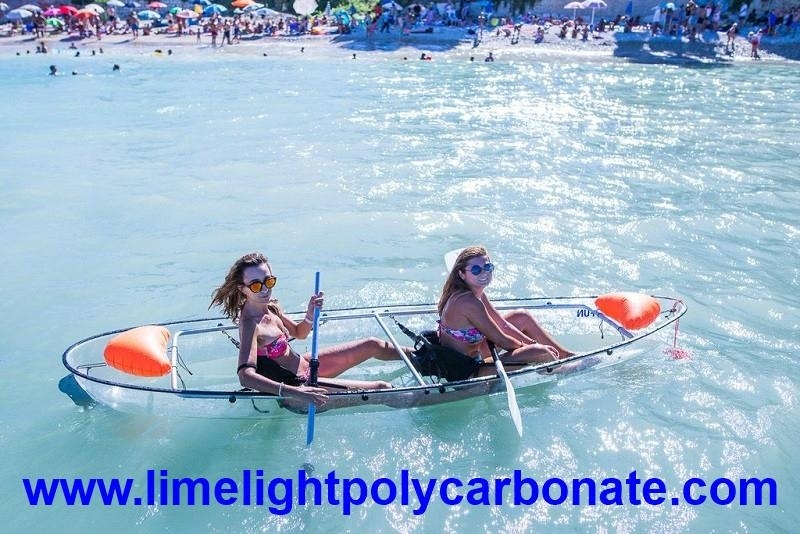 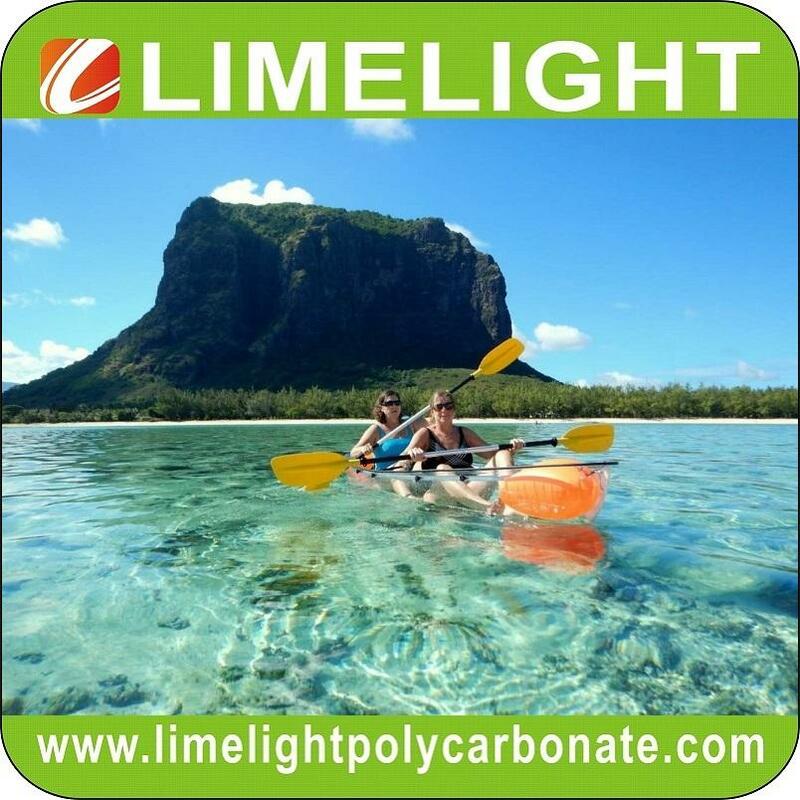 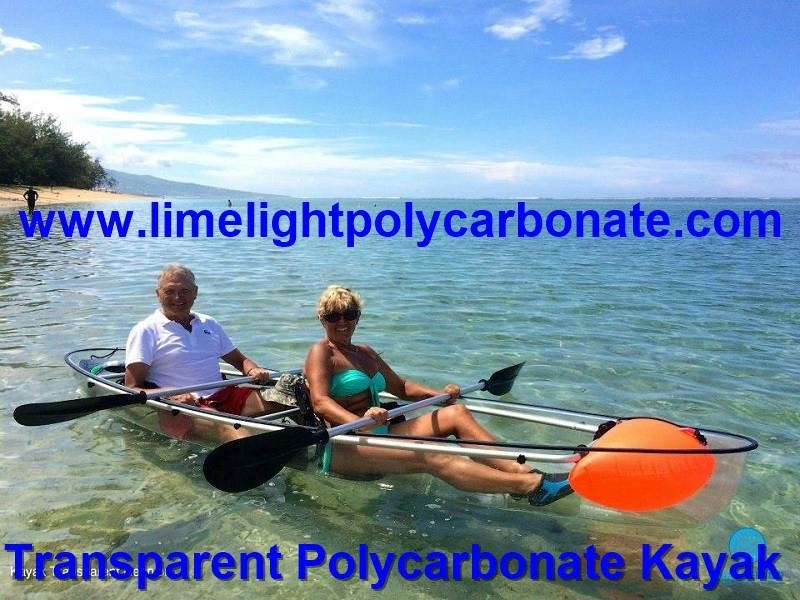 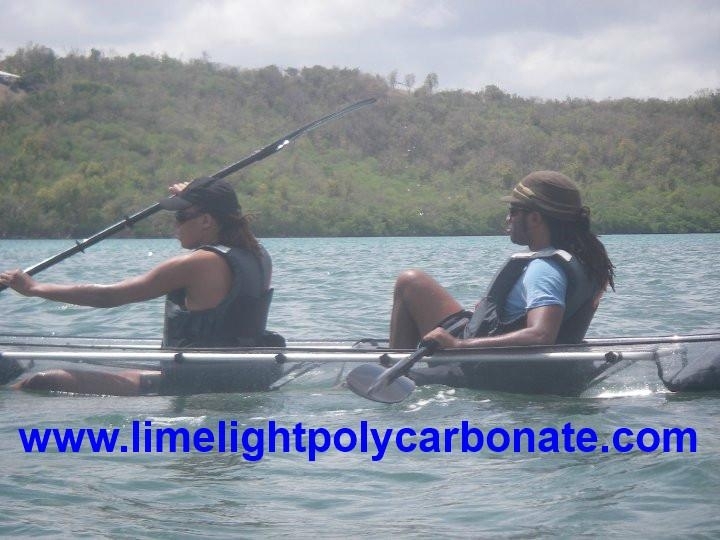 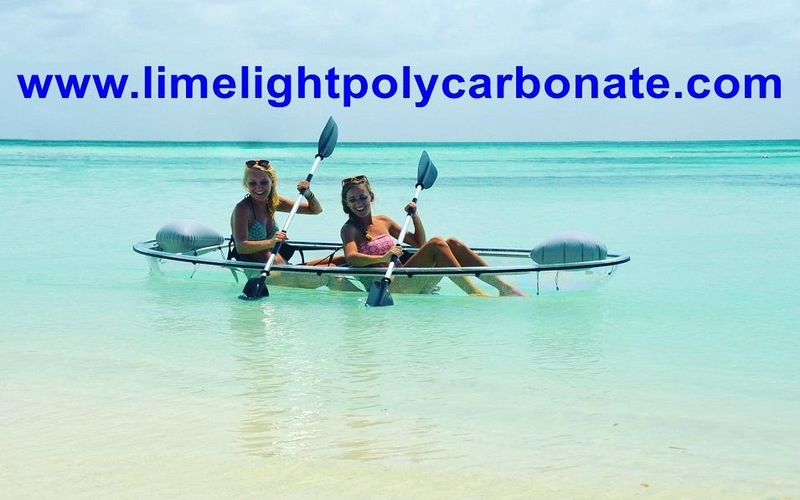 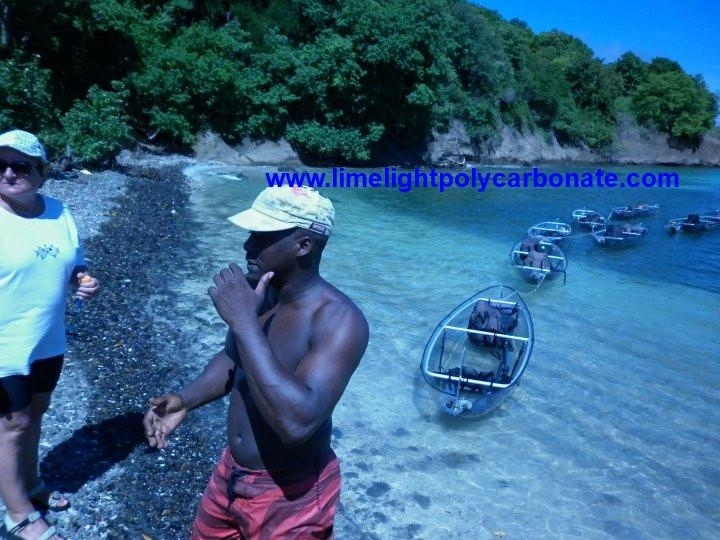 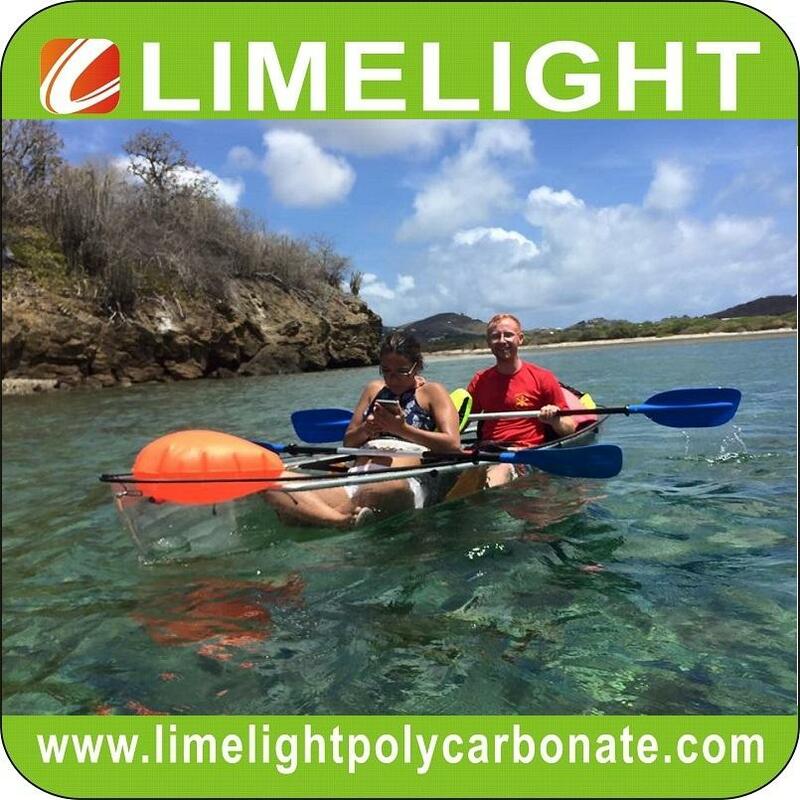 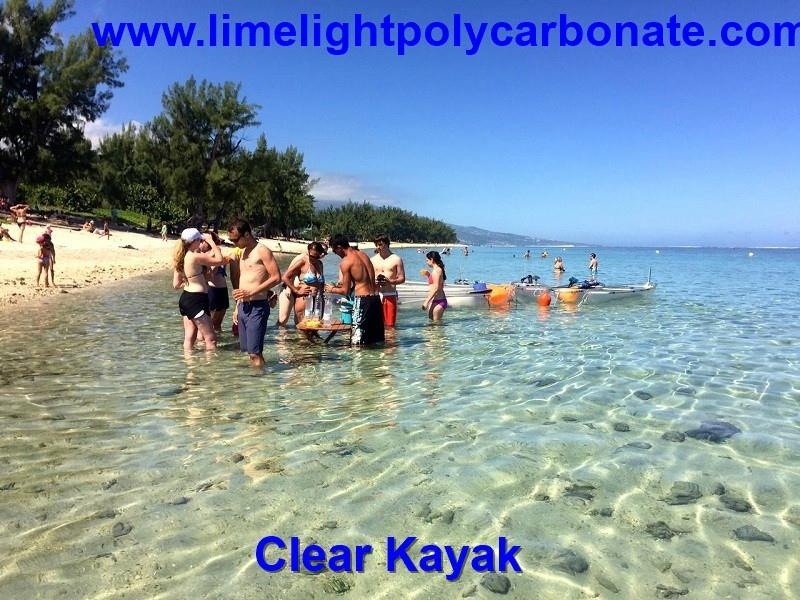 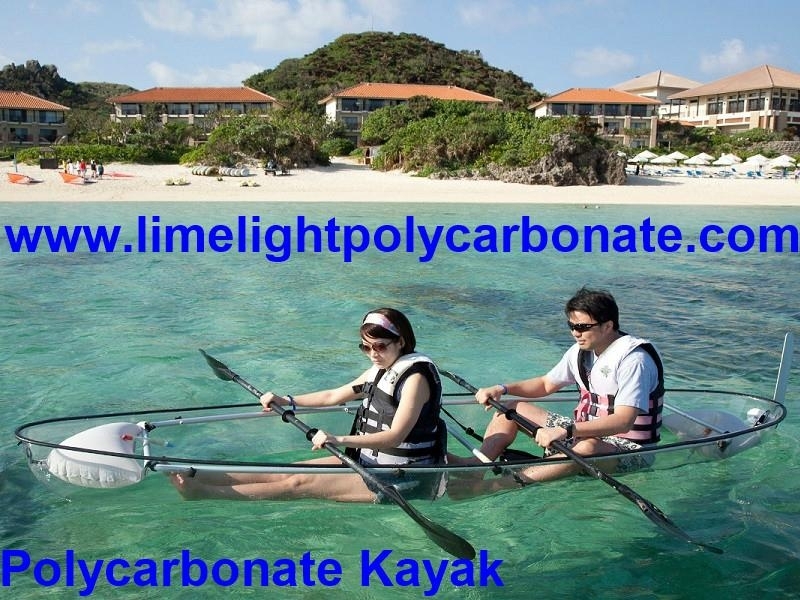 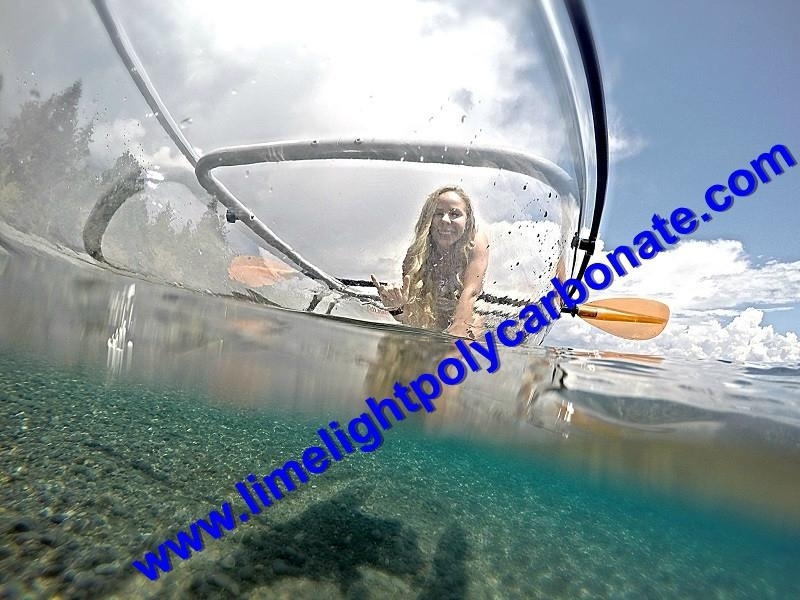 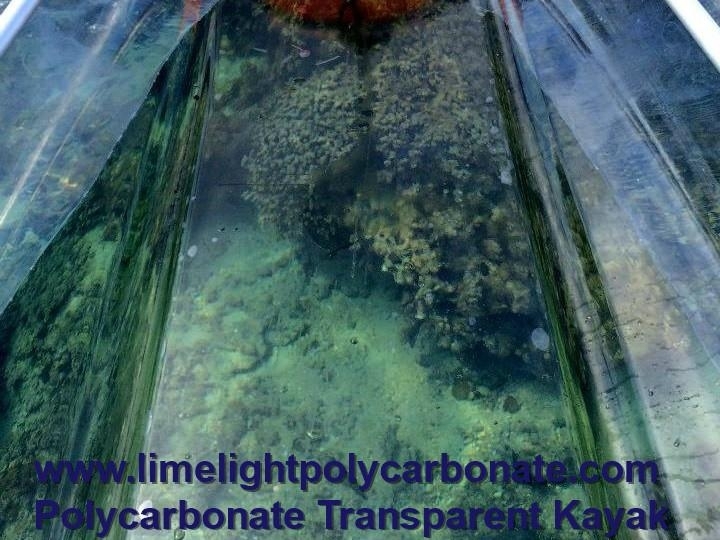 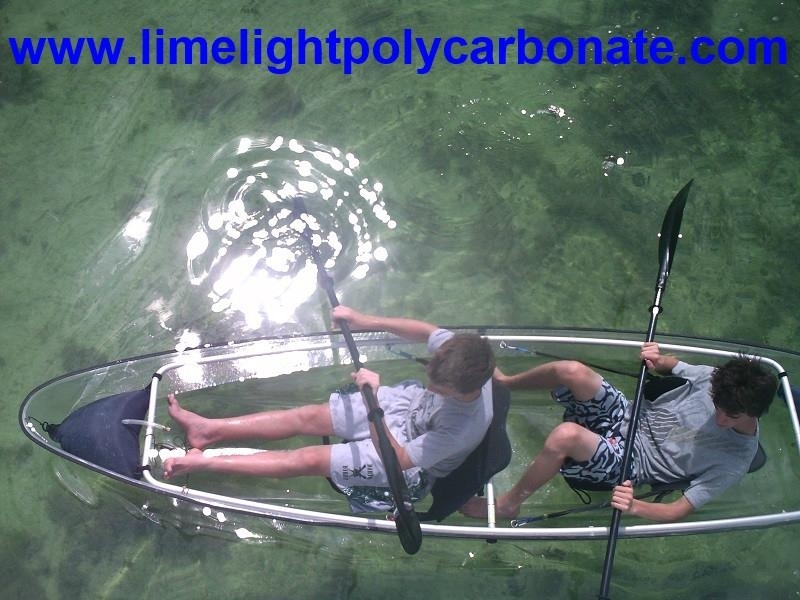 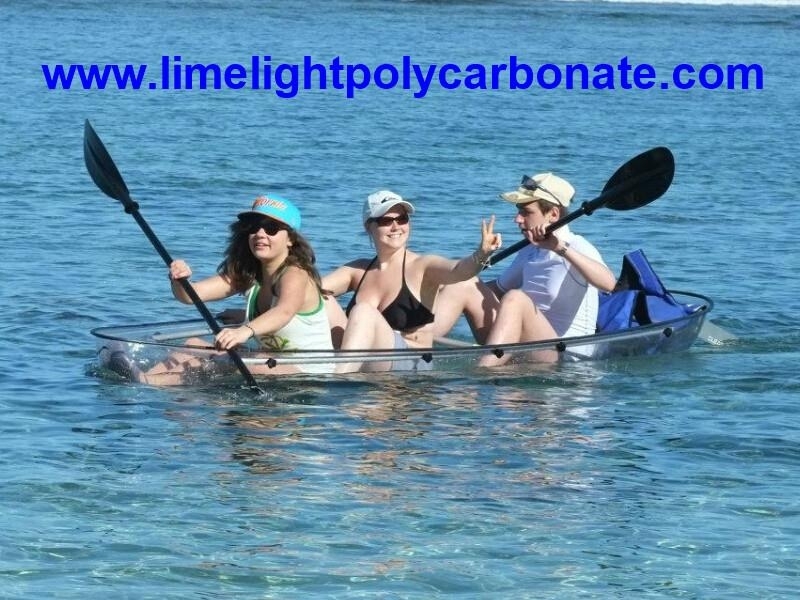 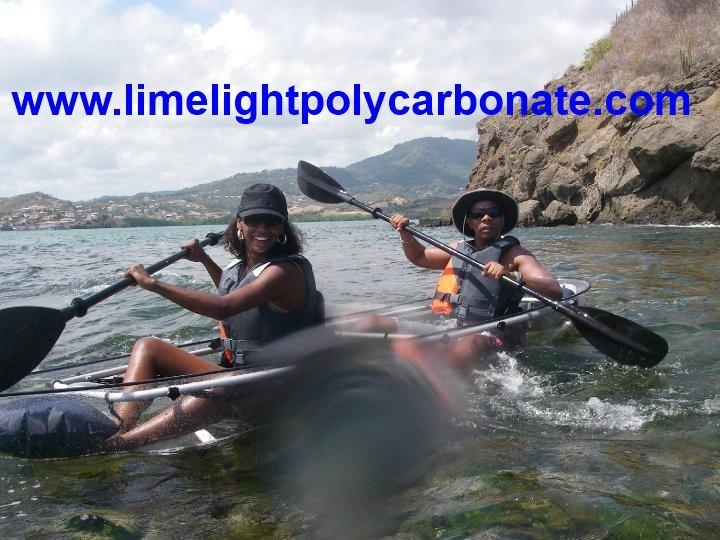 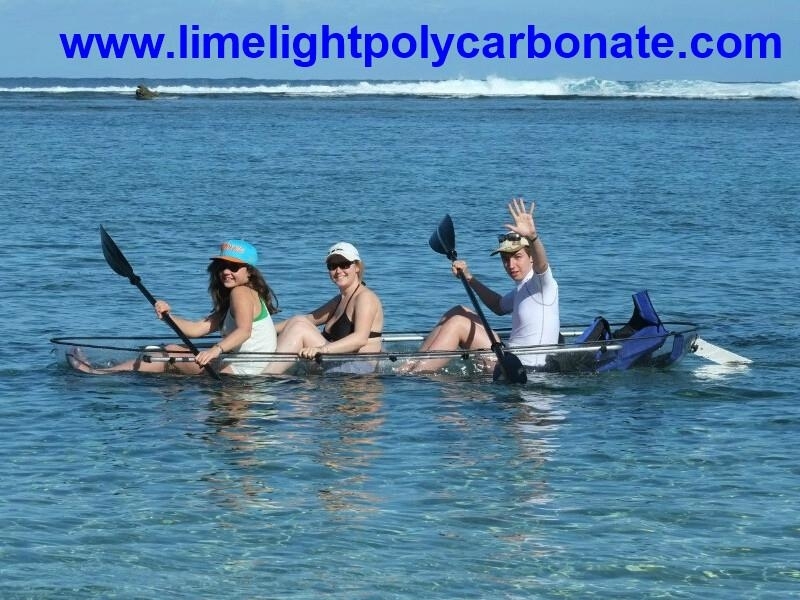 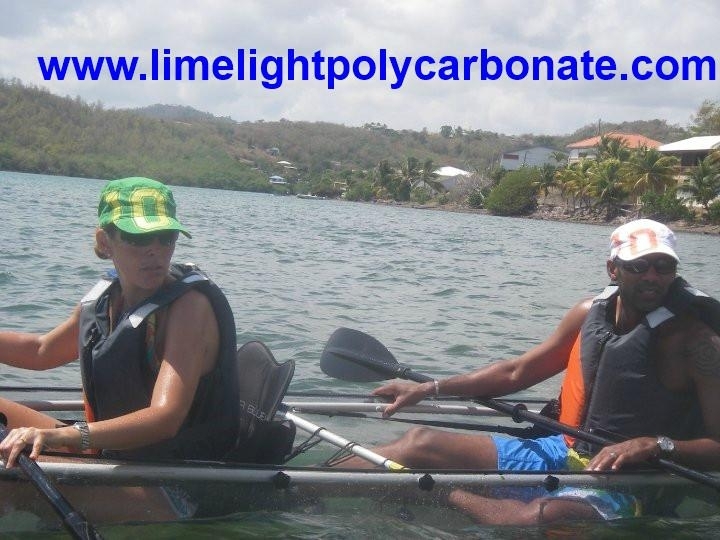 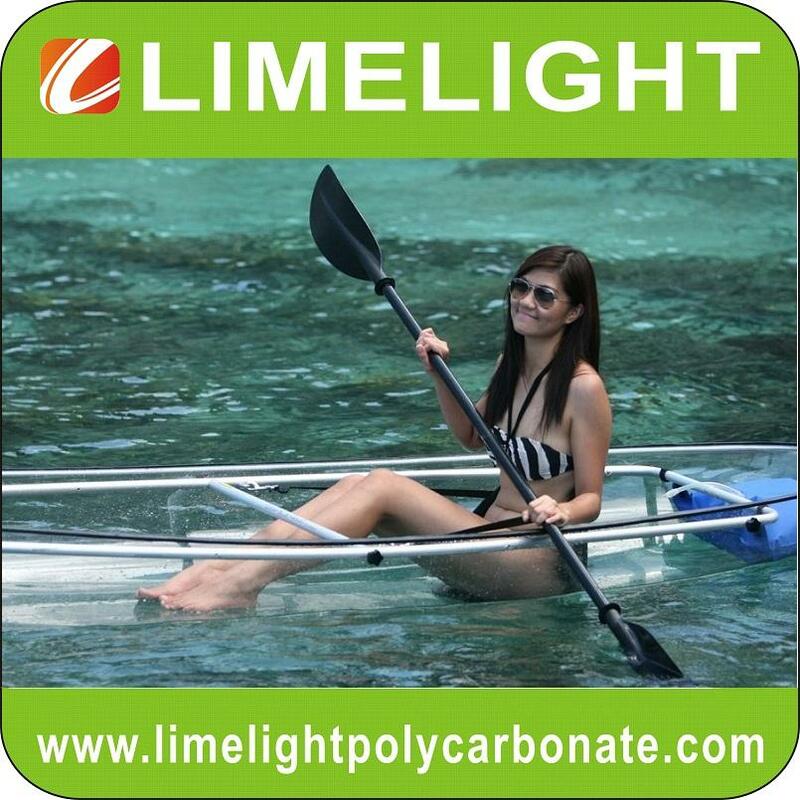 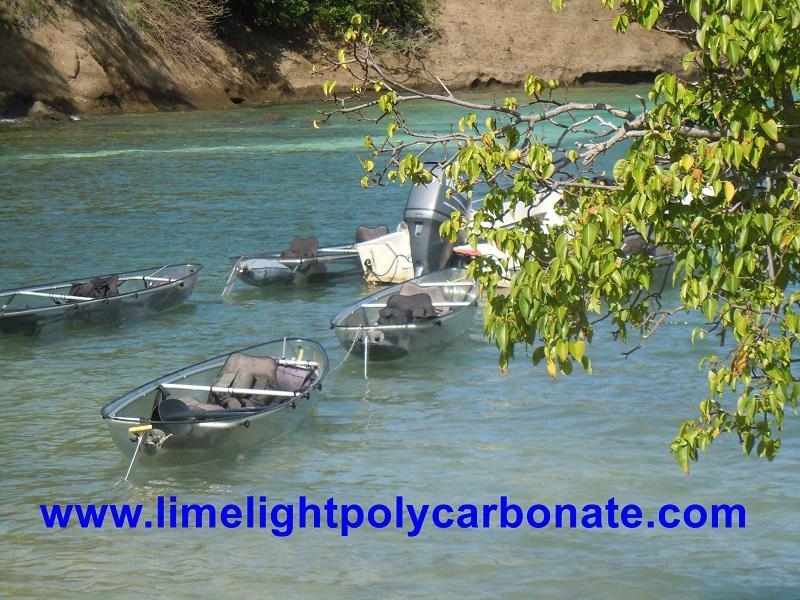 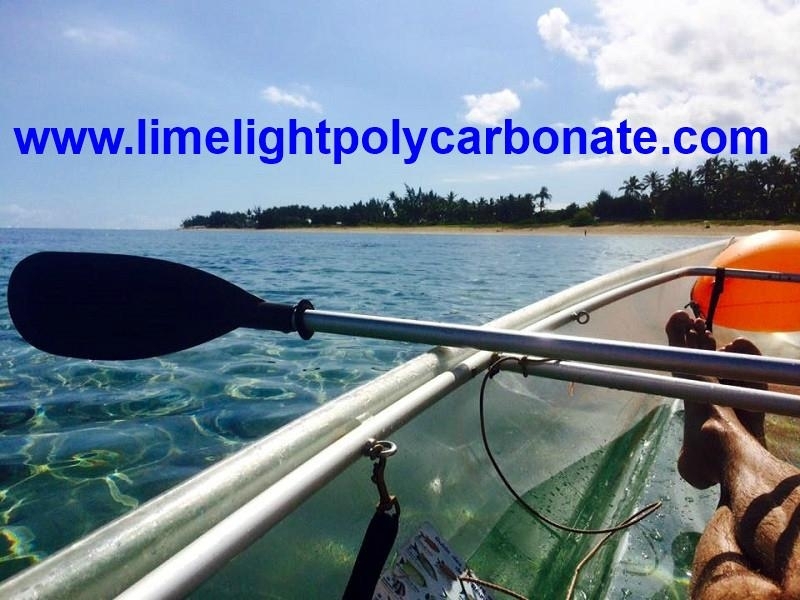 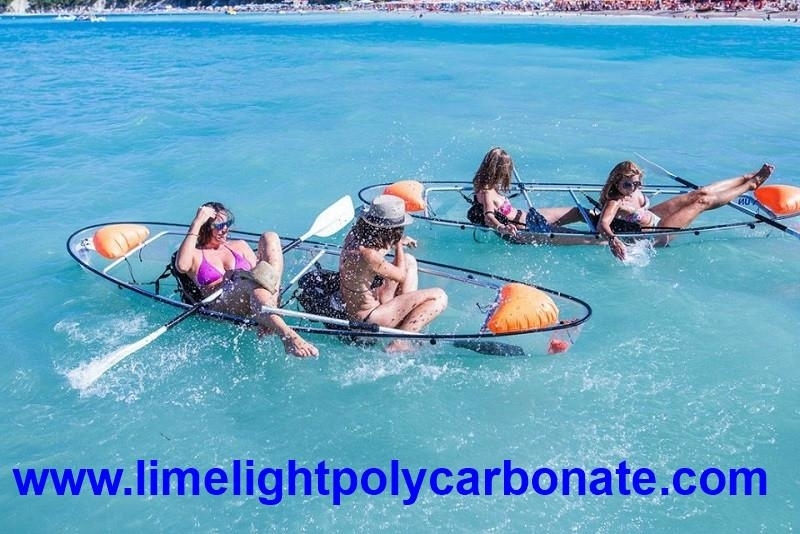 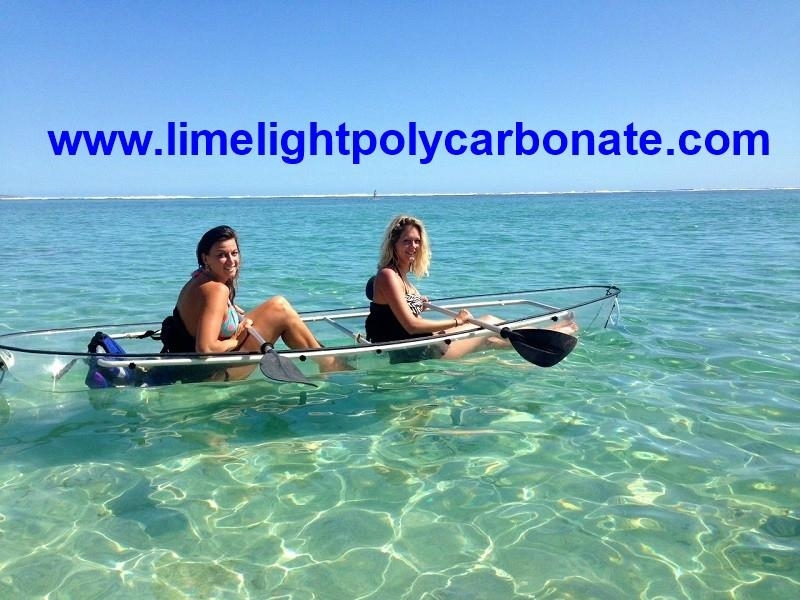 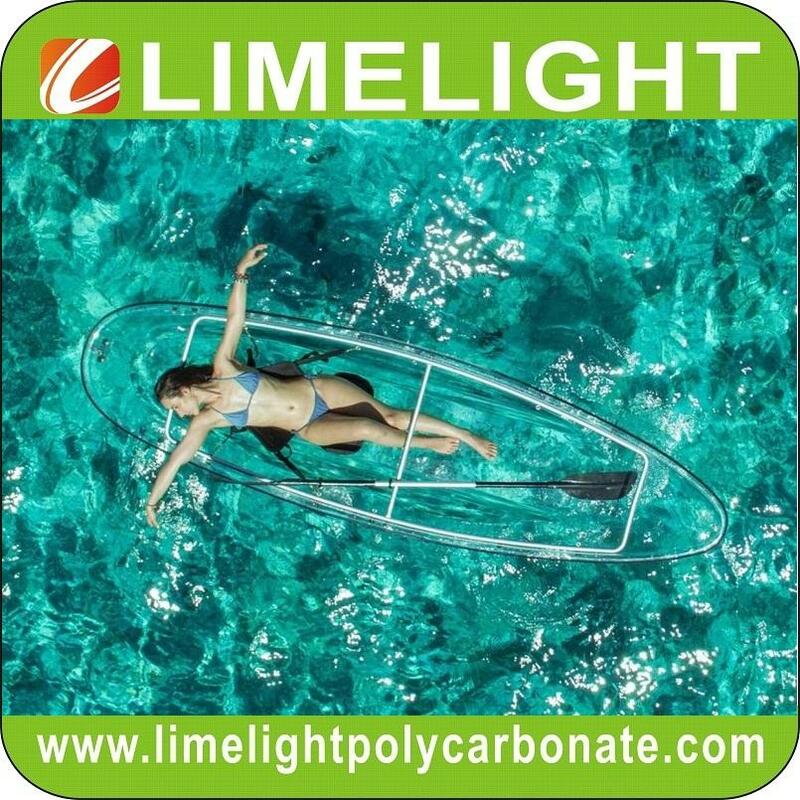 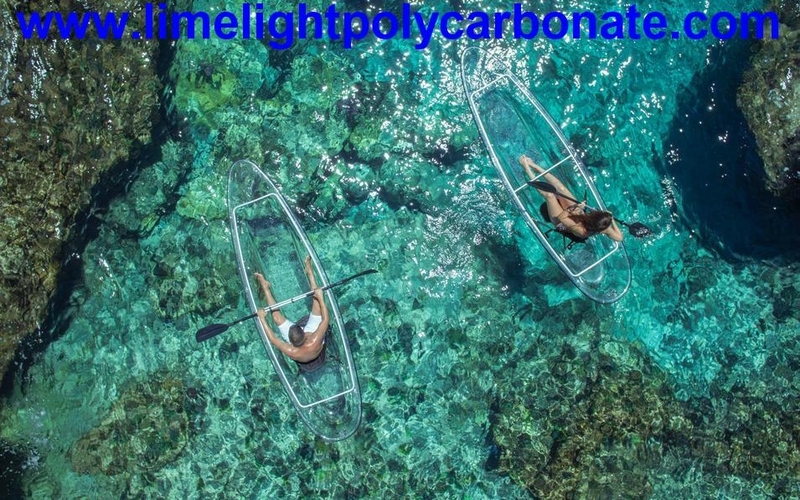 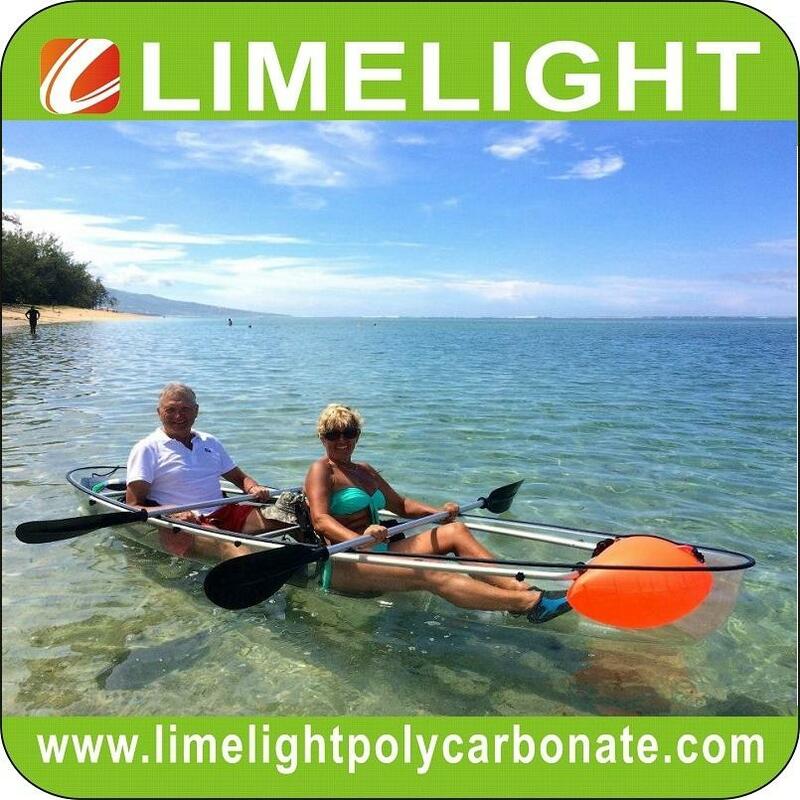 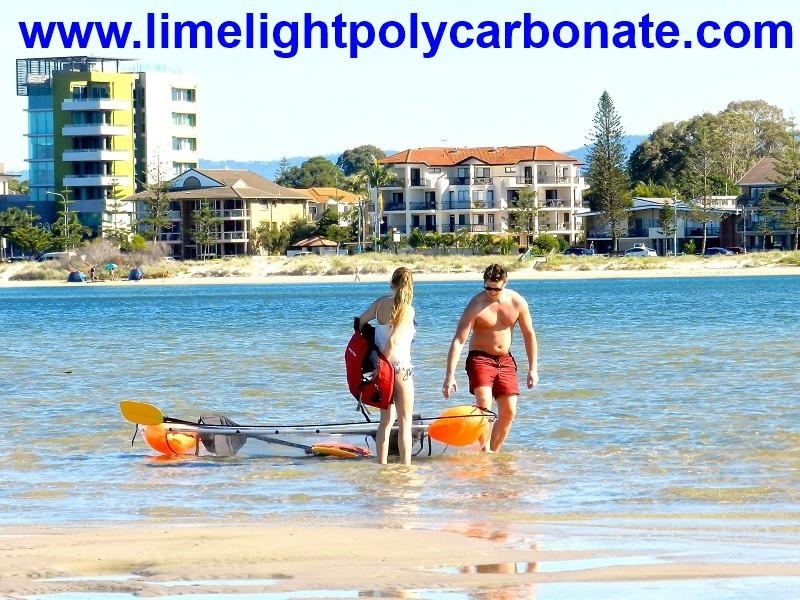 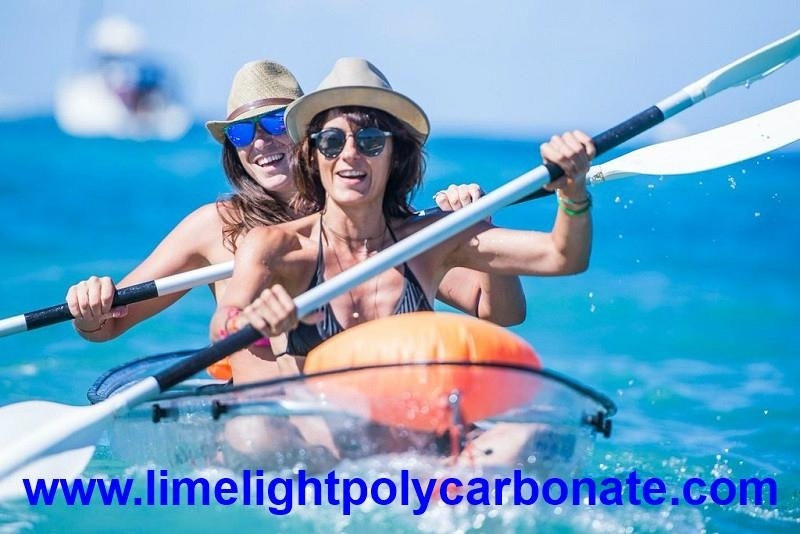 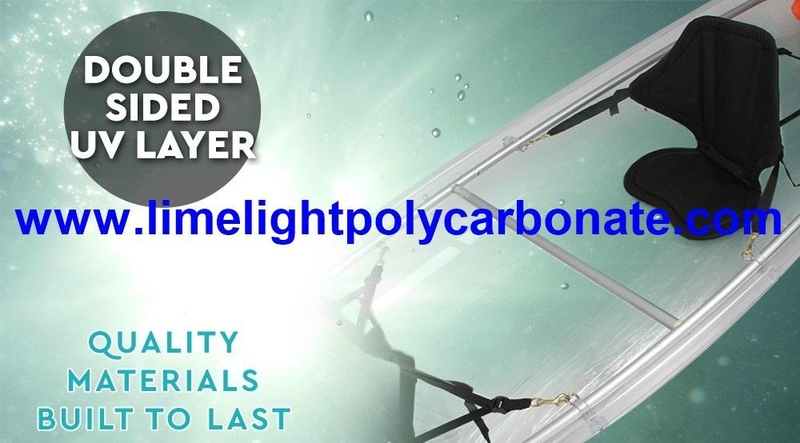 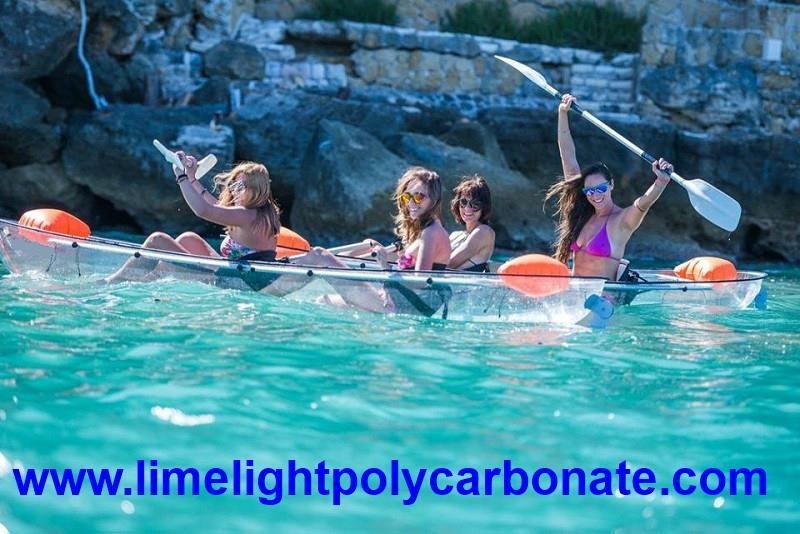 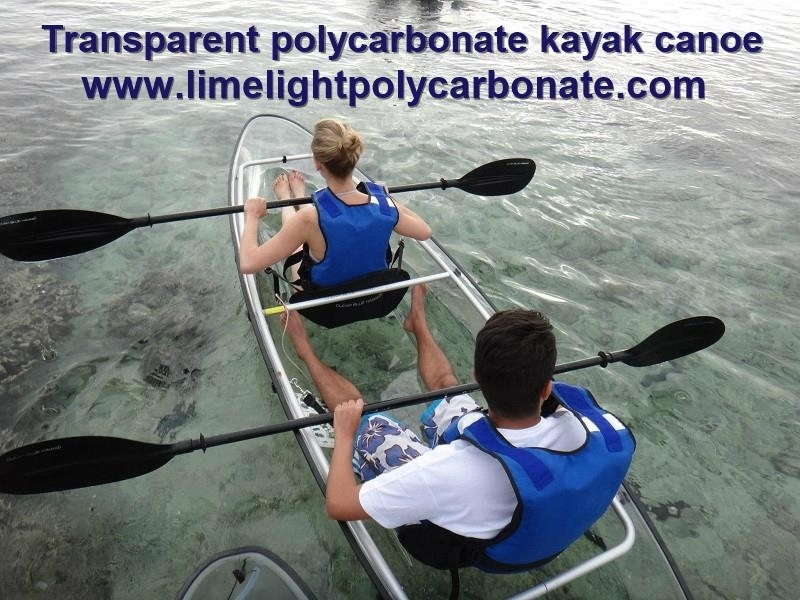 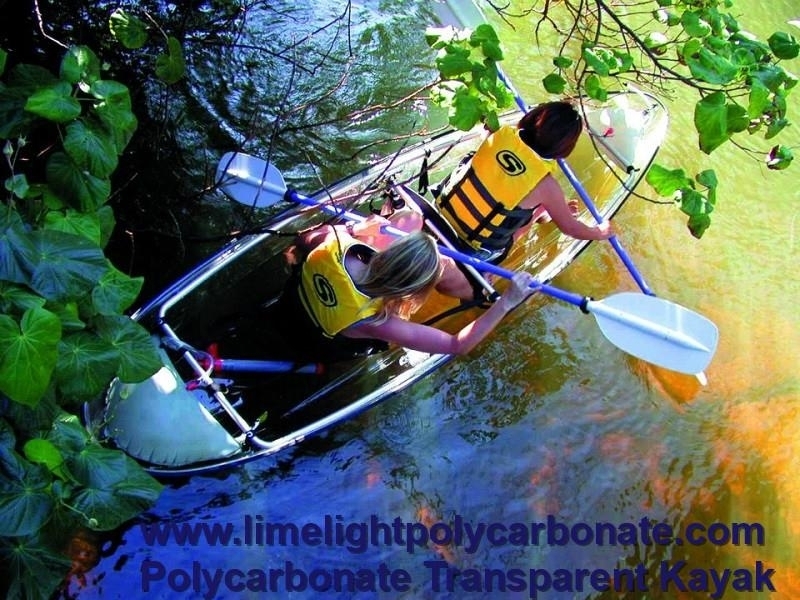 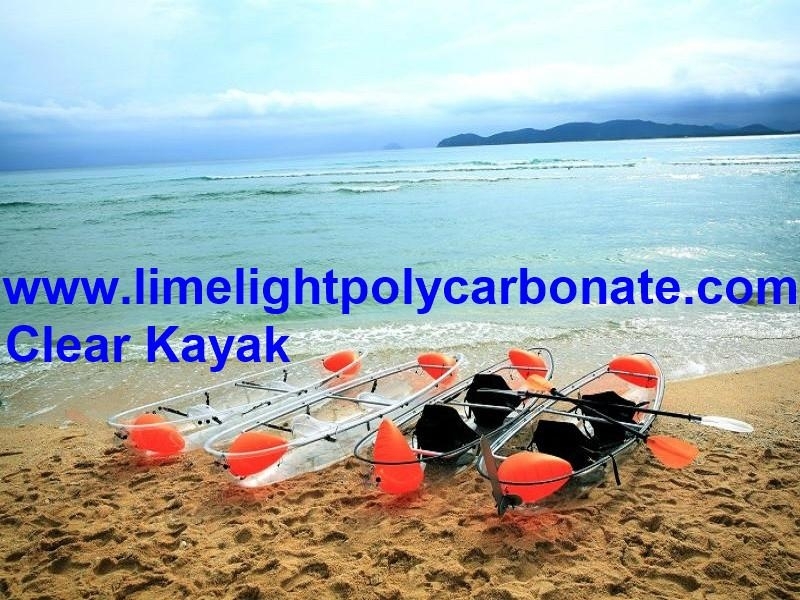 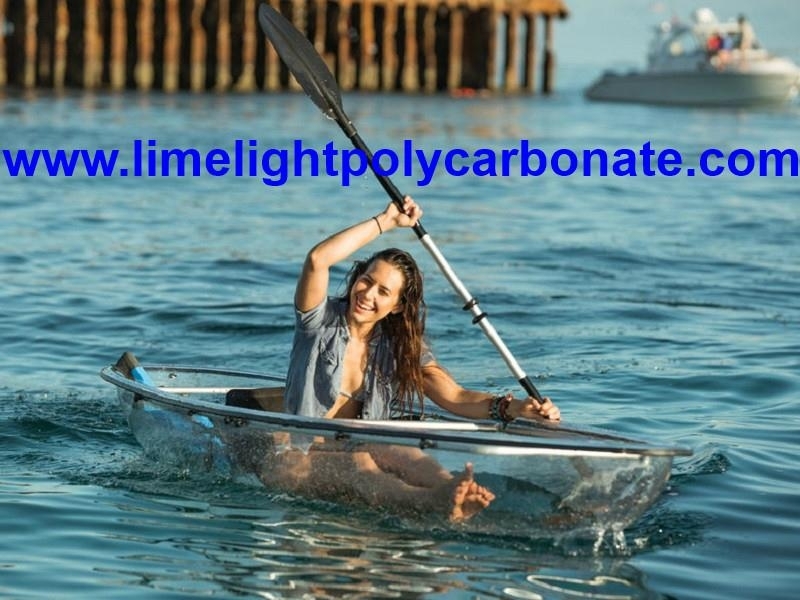 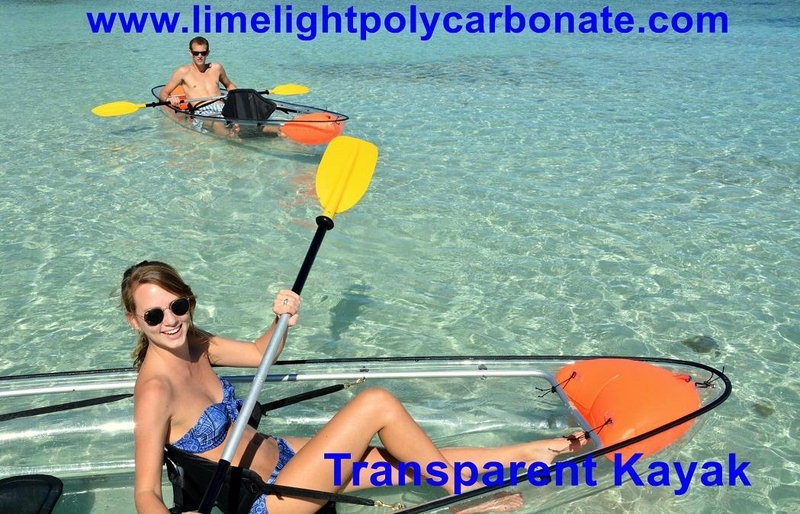 LIMELIGHT full transparent kayak/clear kayak is mainly made of 100% virgin polycarbonate resin from Makrolon Bayer in Germany and Lexan GE in USA, with incredible impact resistant and durability to ensure good quality and tourist safety. 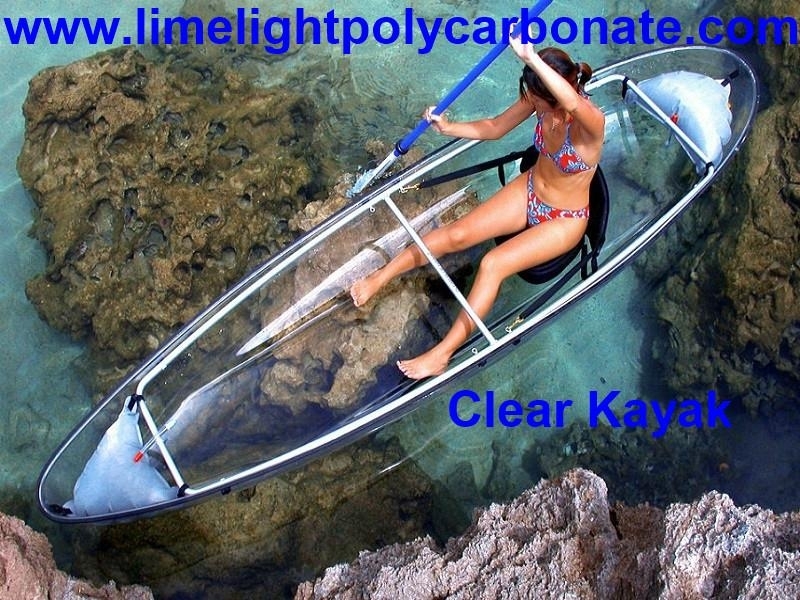 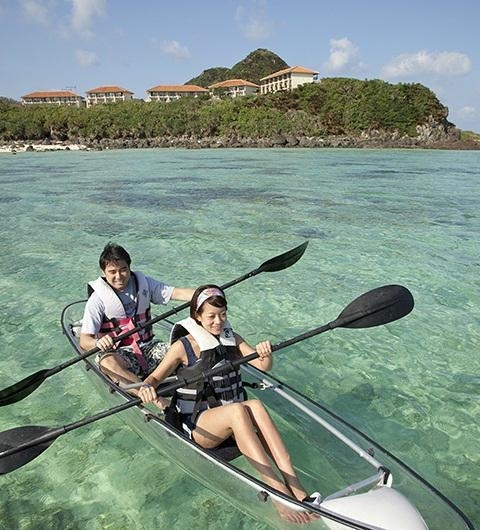 Clear kayak comes equipped with an anodized aluminum internal frame system, dual flotation bladders, two pieces double ended paddles, two pieces seats and one piece retractable skeg system, etc. 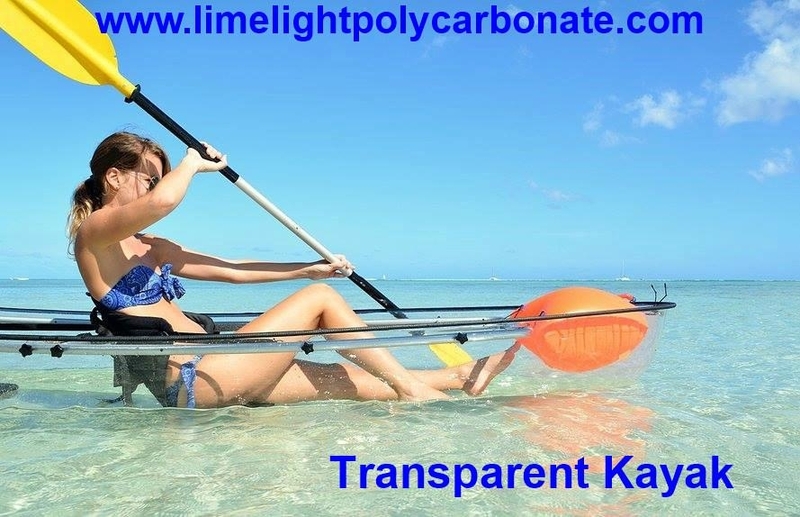 The transparent kayak features a removable lightweight anodized aluminum frame system, allowing the user to minimize space consumption, thus making transporting and storage of multiple units easy and convenient. 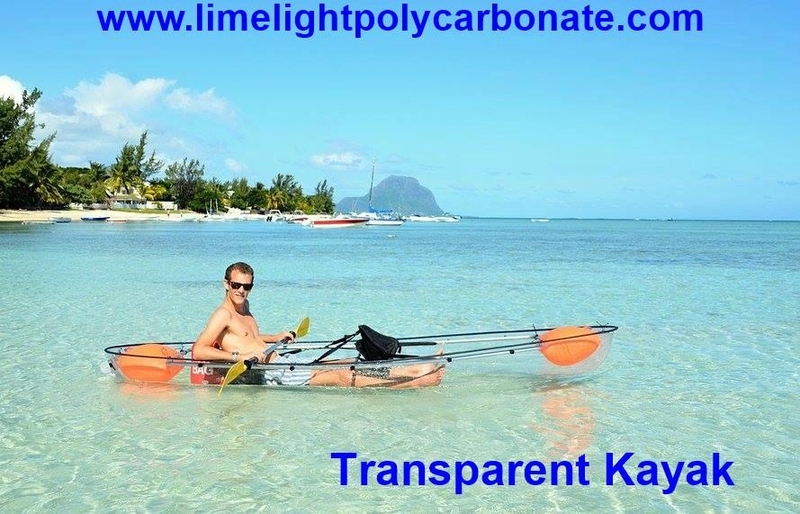 The simple purity of the transparent kayak's elegant yet powerful transparent hull has an irresistible beauty. 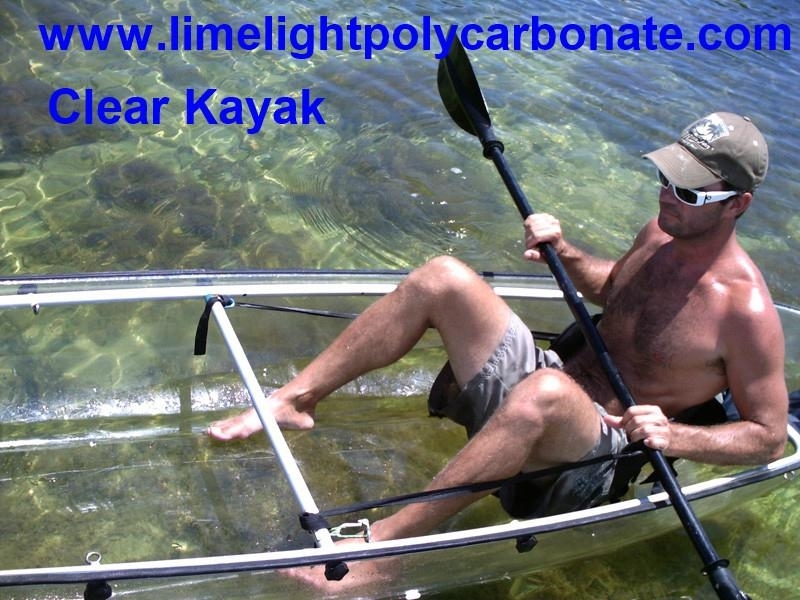 The Aluminum internal frame and the timeless, no-frills shapes of the kayak accessories create a sportive and modern effect. 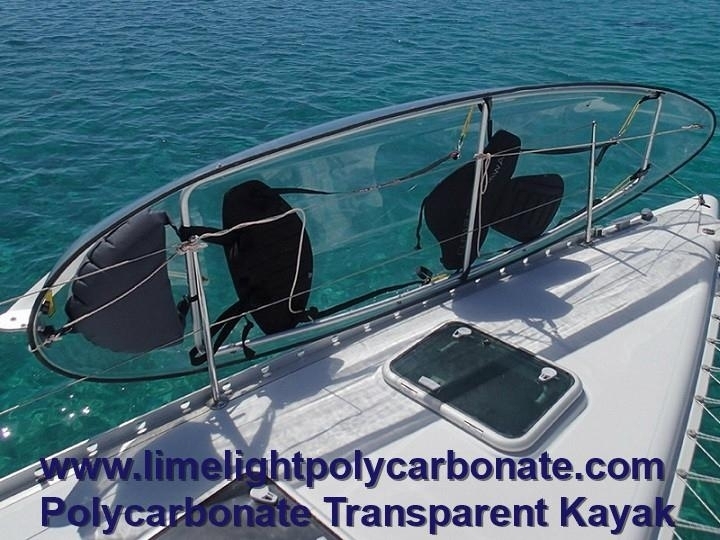 Classical exclusivity is conveyed by the sleek curves and brilliant transparency. 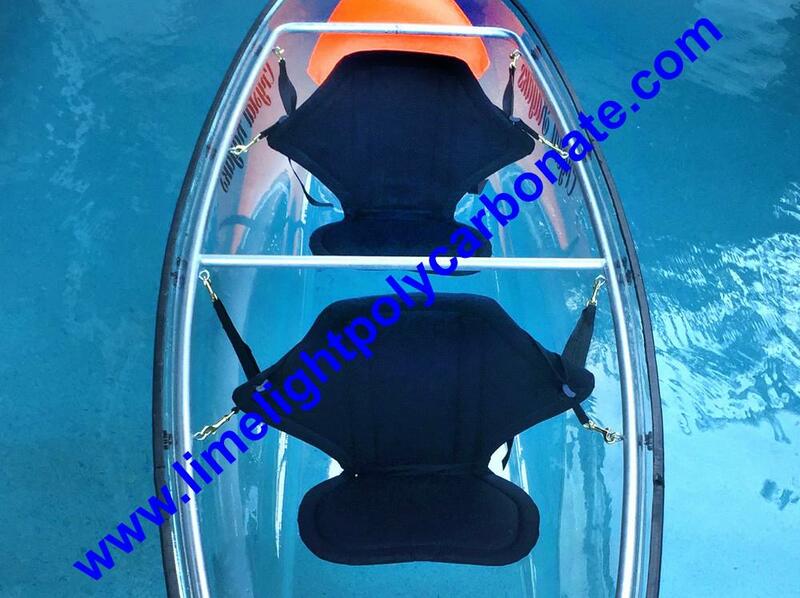 Sportive seats designed for comfort not only make for a pleasant trip, but also meet your demands for quality and style. 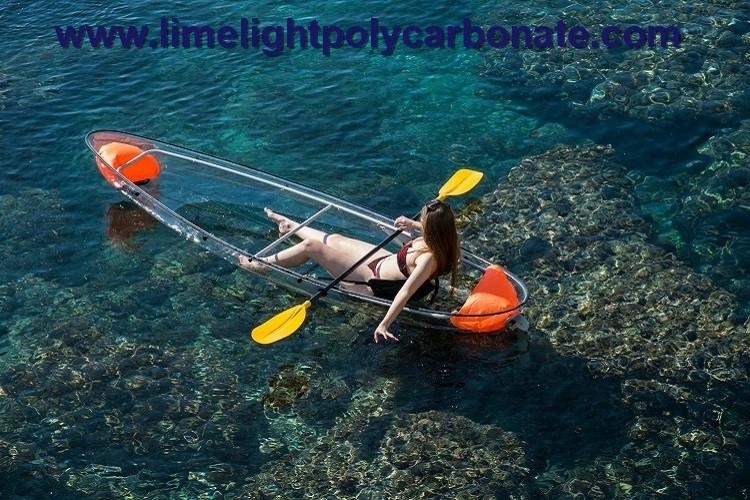 This model is recommend for areas that experience calm ocean conditions. 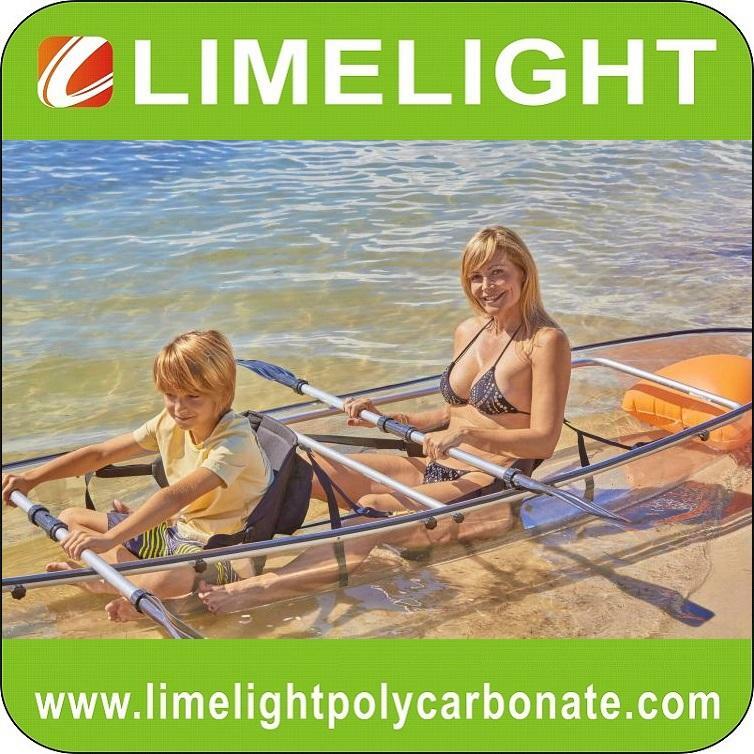 New retractable skeg system included in the standard version improves tracking, a feature especially convenient for long distance paddling. 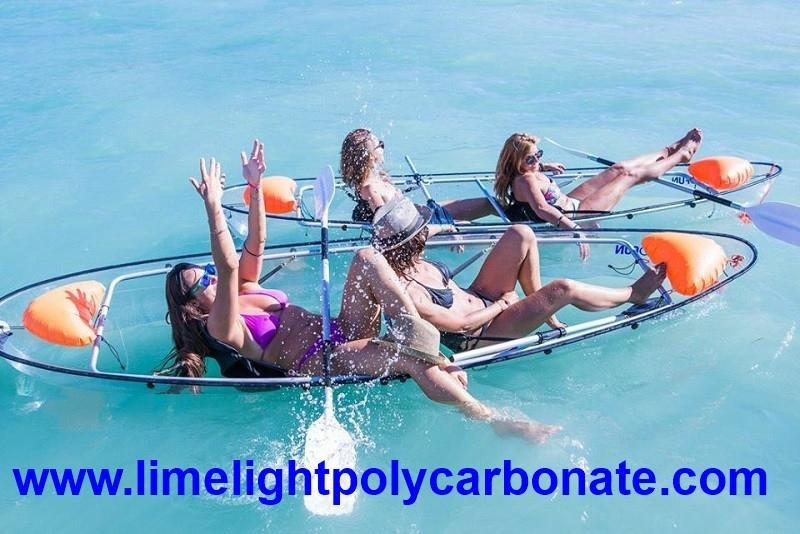 If purchased additionally, the new optional outrigger system improves stability when in choppier waters and renders flipping practically impossible. 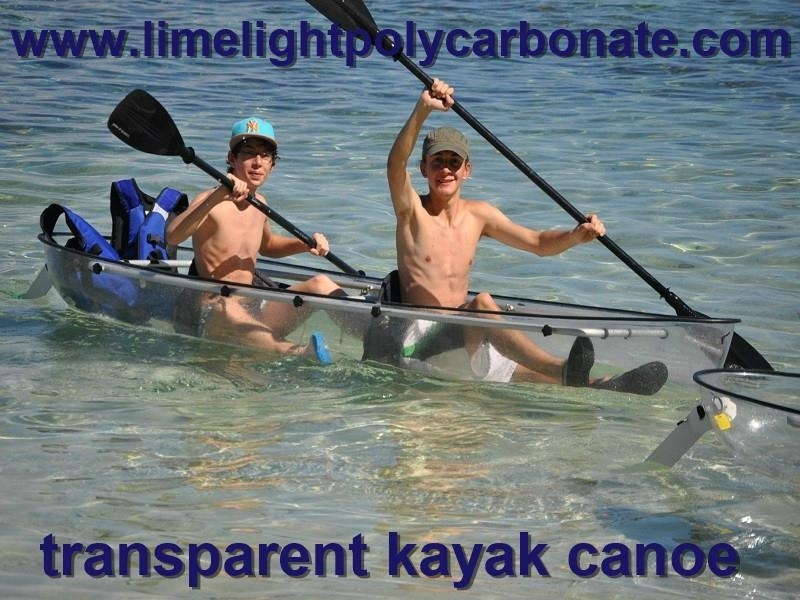 Unparalleled material durability, weather ability and impact resistant are among the transparent kayak's advantages. 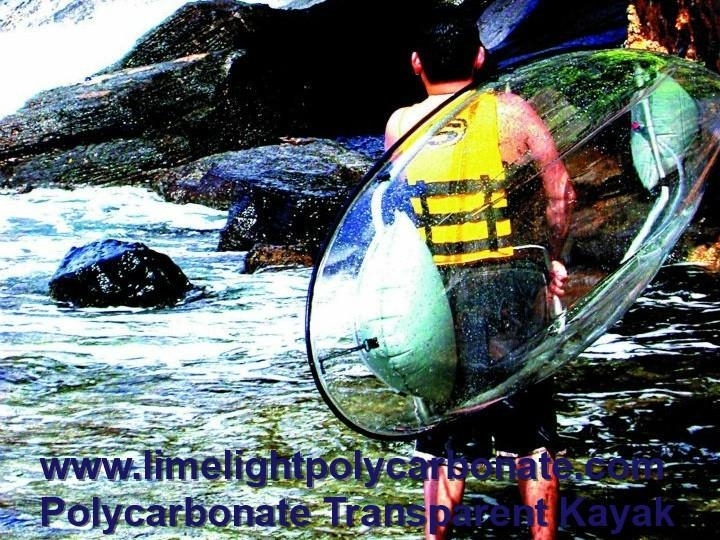 Impact resistant tests have included intense crashing against rocky shorelines, 20 ft drops, hammer blows and an ejection from a vehicle at 70mph. 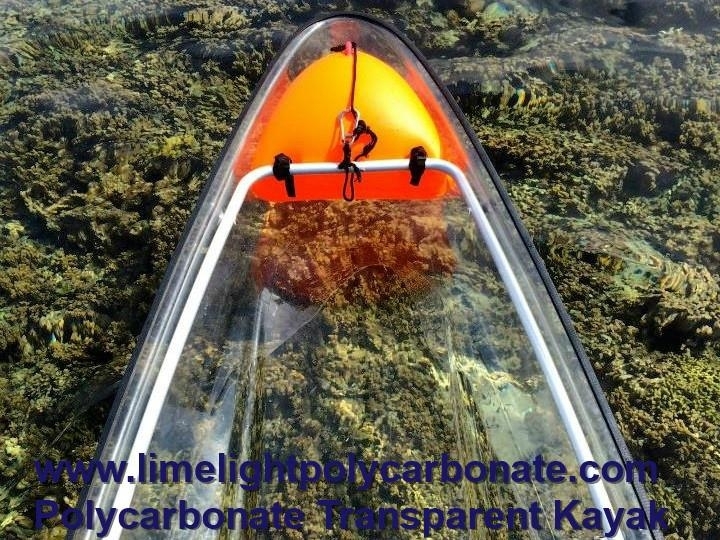 Tests performed have proven that the visibility on a sunny day and during non-turbulent water conditions can yield views to depths of 75 ft plus for the exploration of new worlds waiting to be discovered. 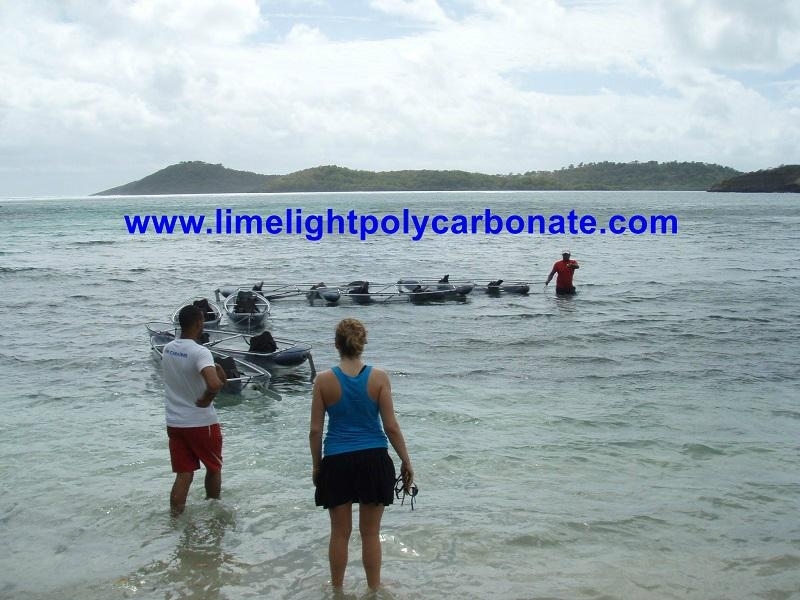 Tests have included encounters with pods of dolphins, coral farms and nocturnal underwater sea life. 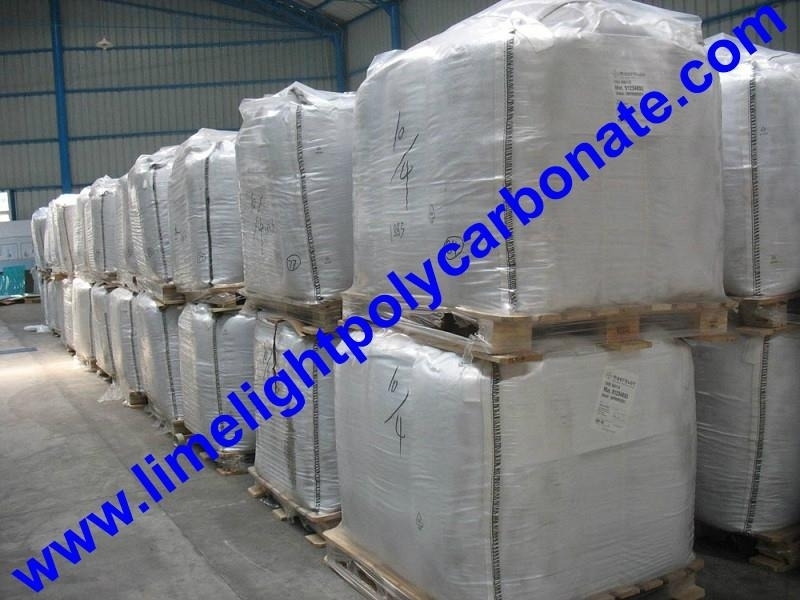 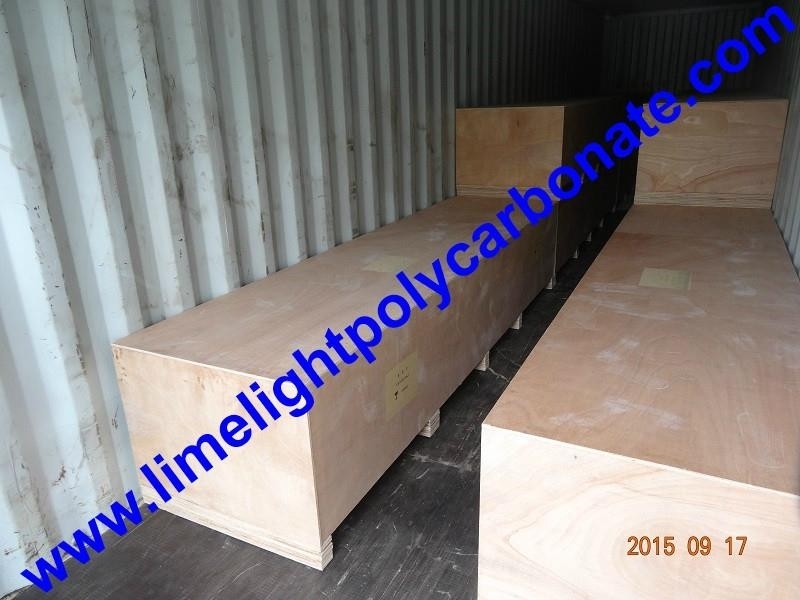 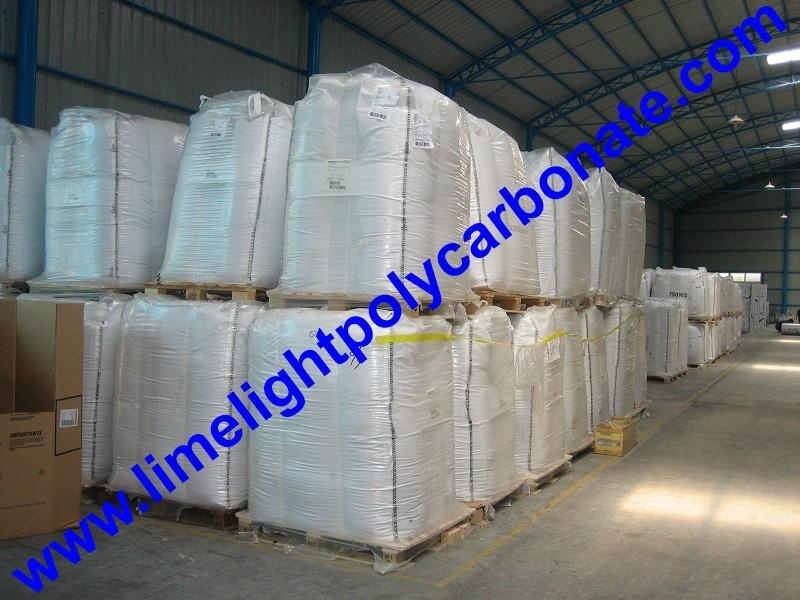 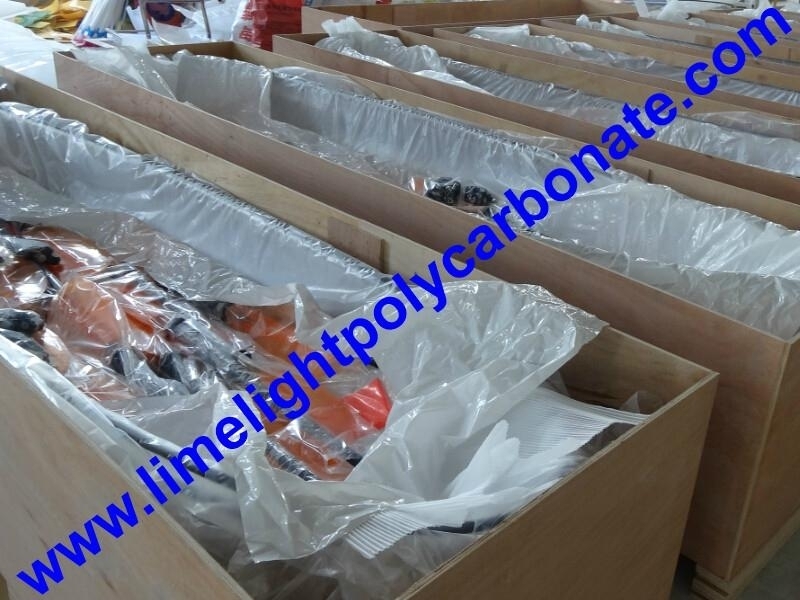 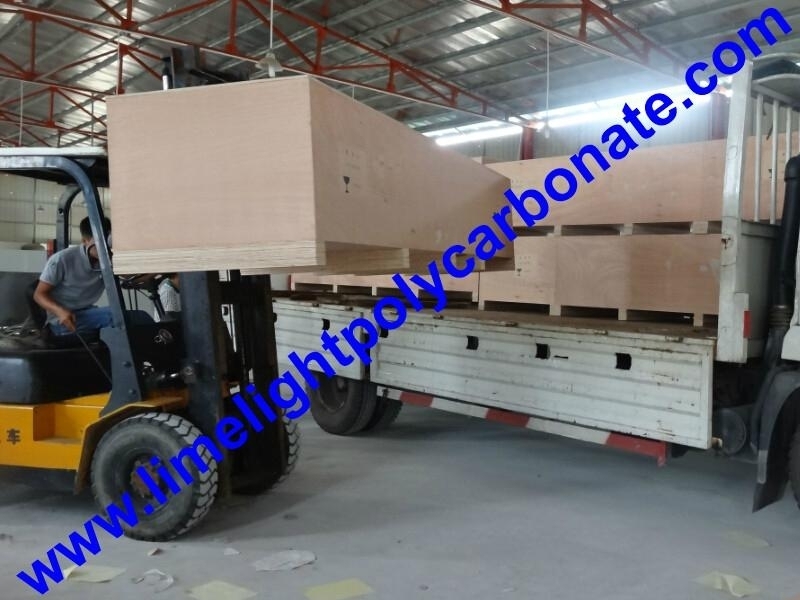 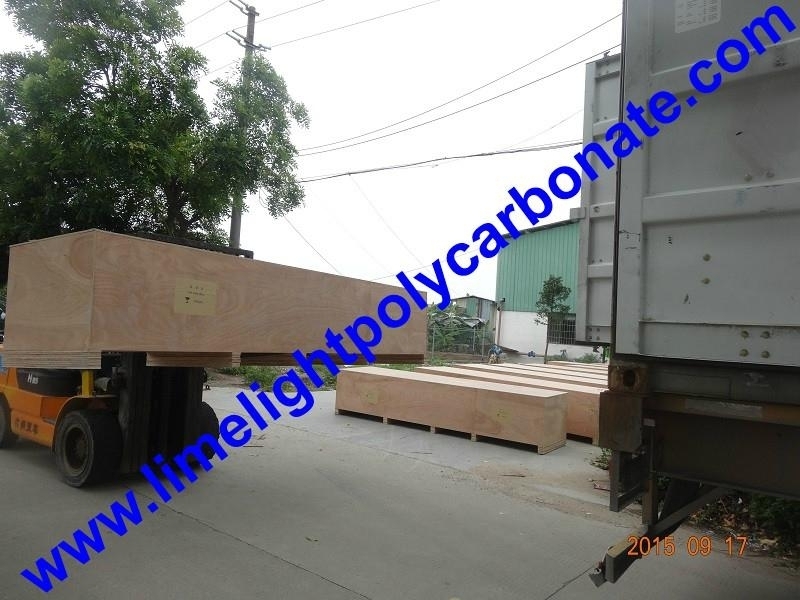 Standard packing: Strong and durable wooden box + Protection film. 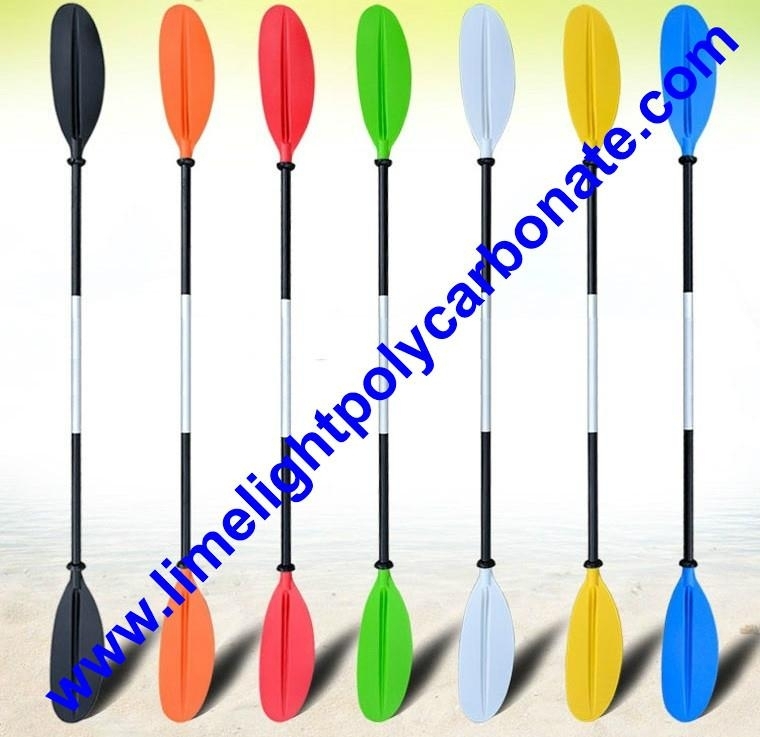 Colorful Paddle: Black, Orange, Red, Green, White, Yellow, Blue for your choice. 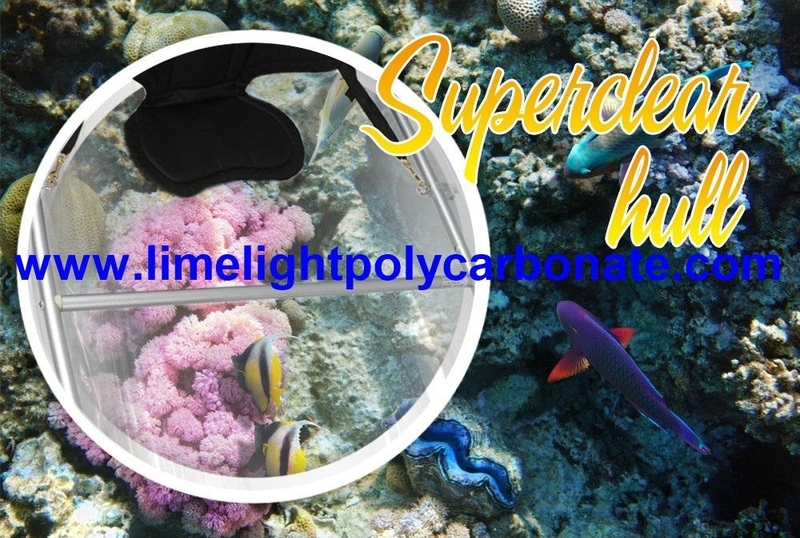 High Impact Resistant: 250 ~ 300 times that of same thickness glass, 30 times that of acrylic sheet. 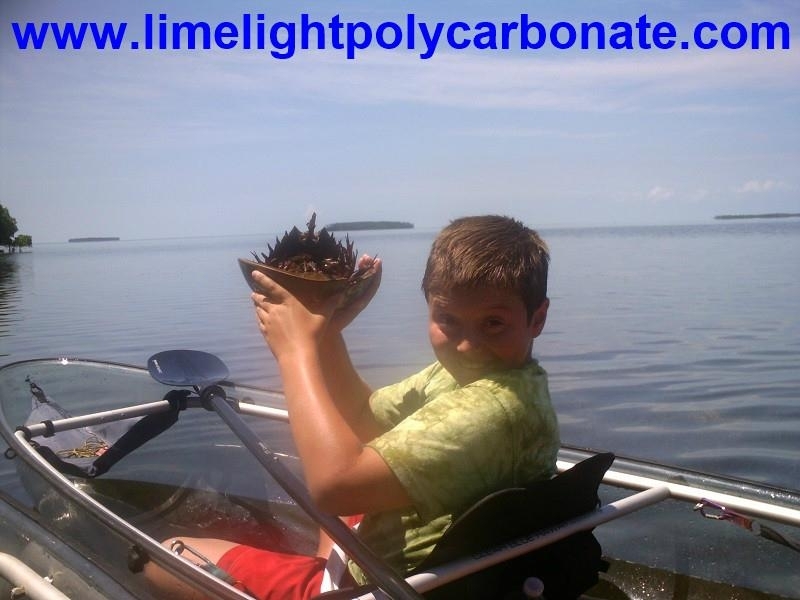 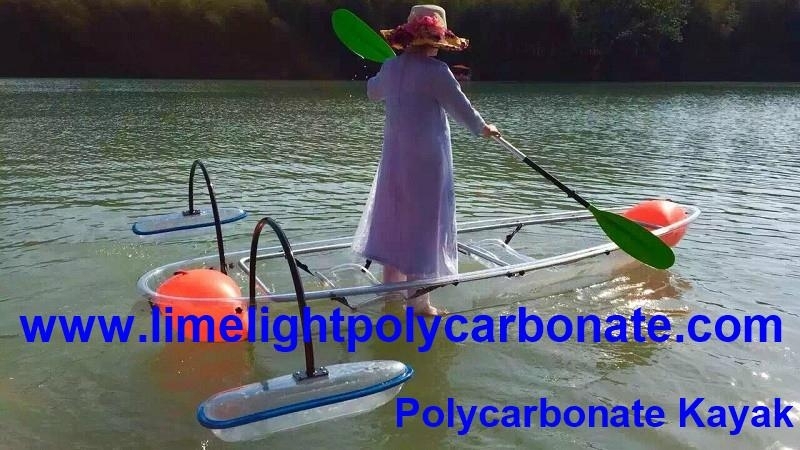 Please view polycarbonate kayak impact resistance test video as below, and you will know how strong the polycarbonate material is. 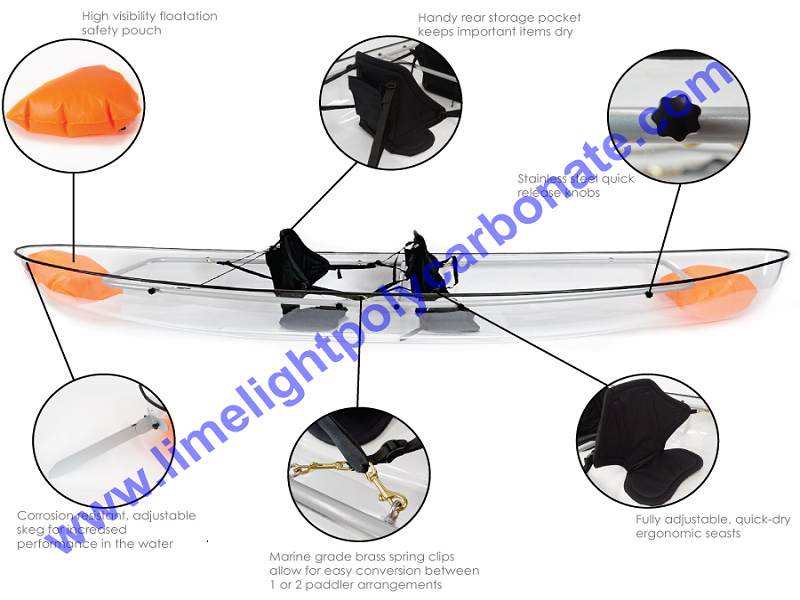 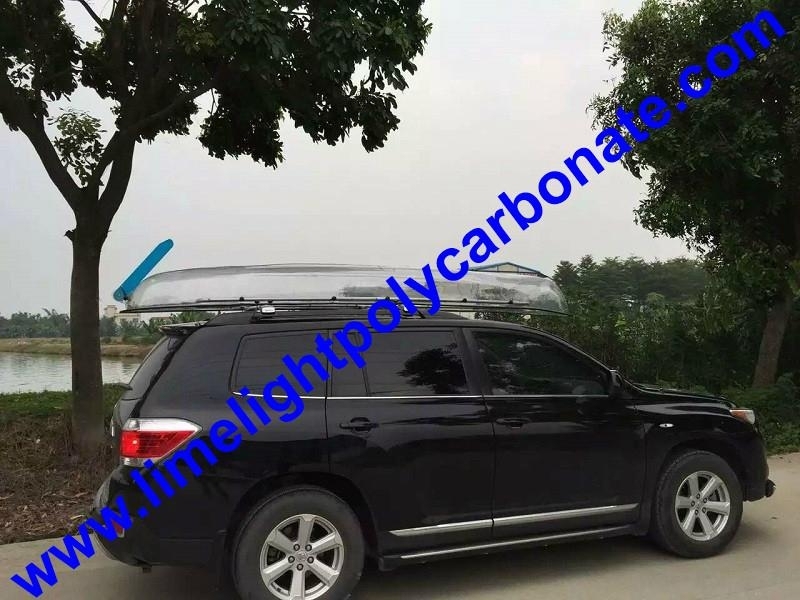 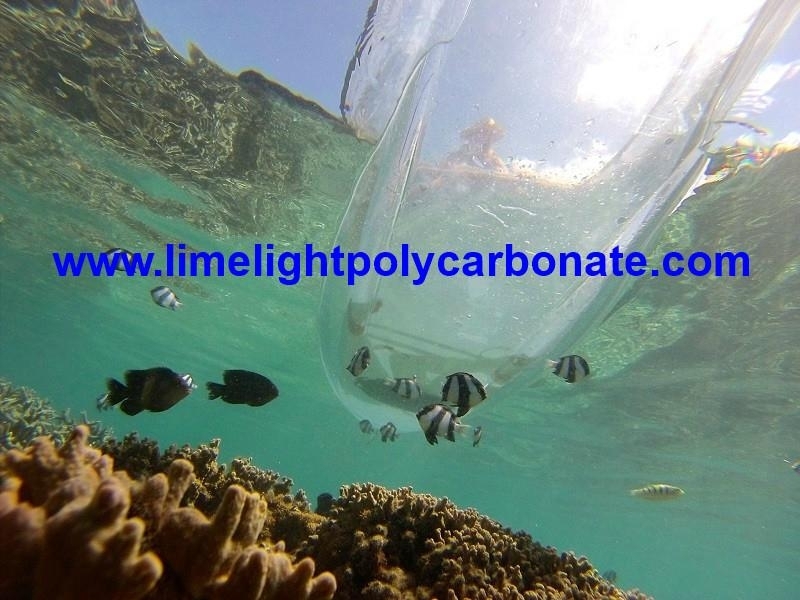 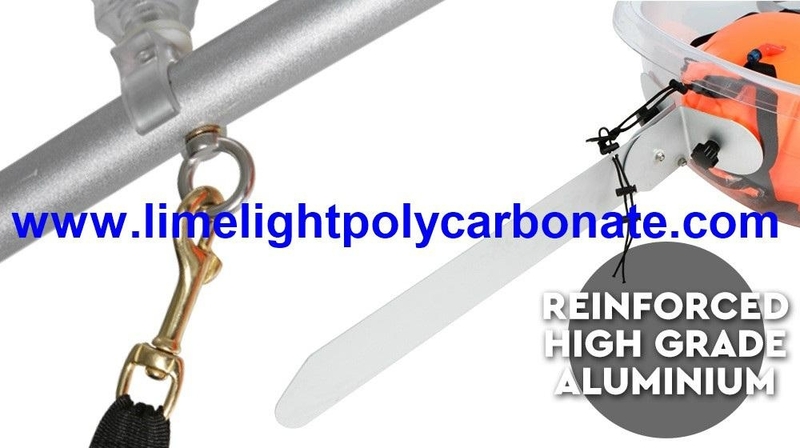 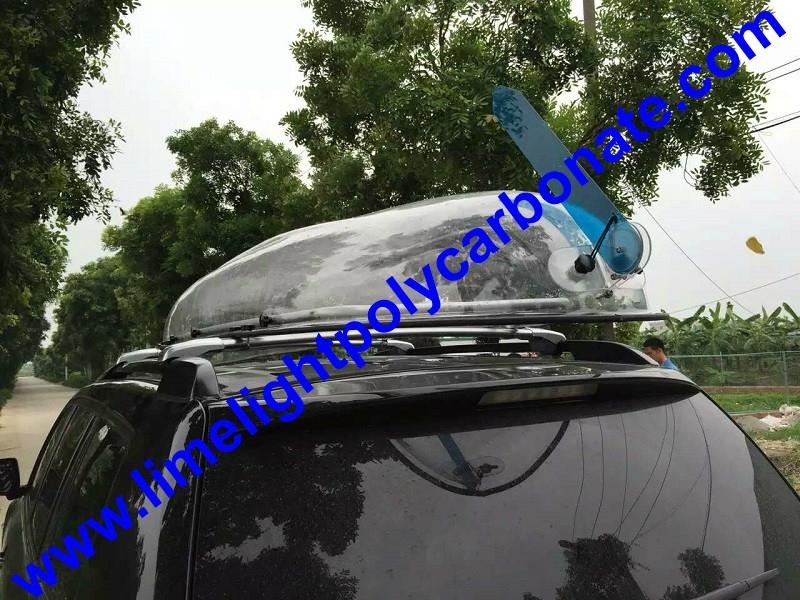 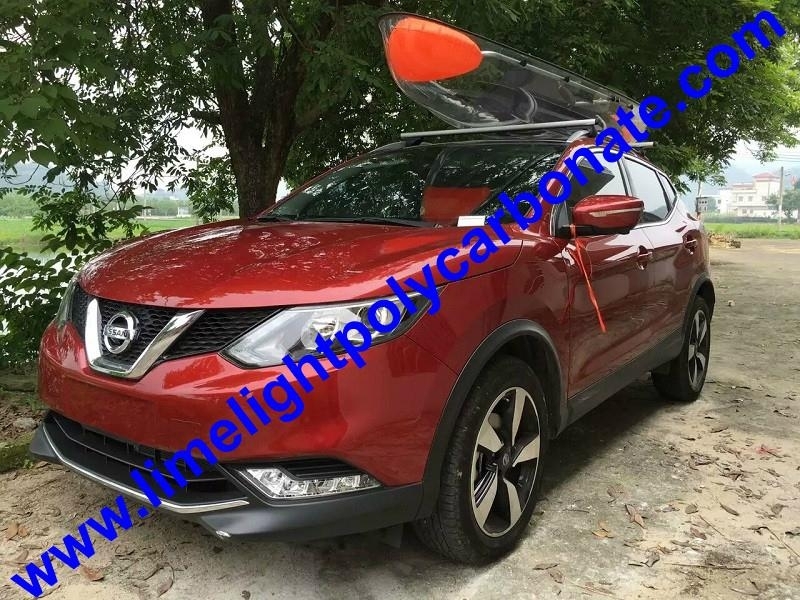 High Light Transmission: Clear Polycarbonate kayak light transmission is up to 80%~90% that of same thickness glass, you can see underwater sea lift clearly. Light Weight: Only 1/2 weight of that same thickness glass, you can take it easily. 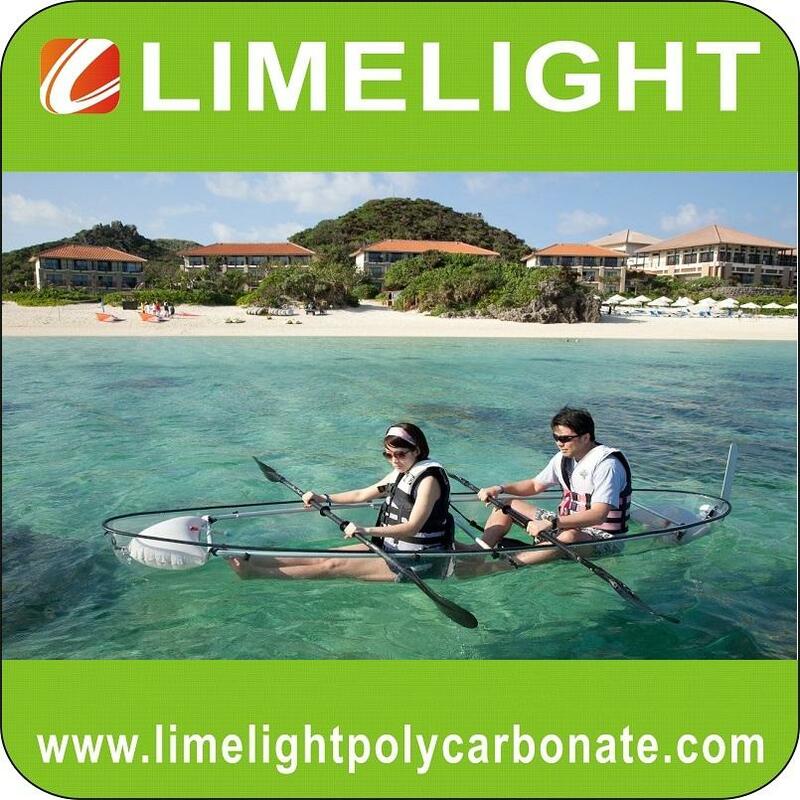 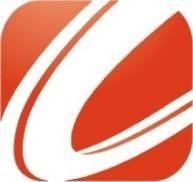 Hotels, resorts, water sport rental companies, vacation homes, individual enthusiasts, etc. 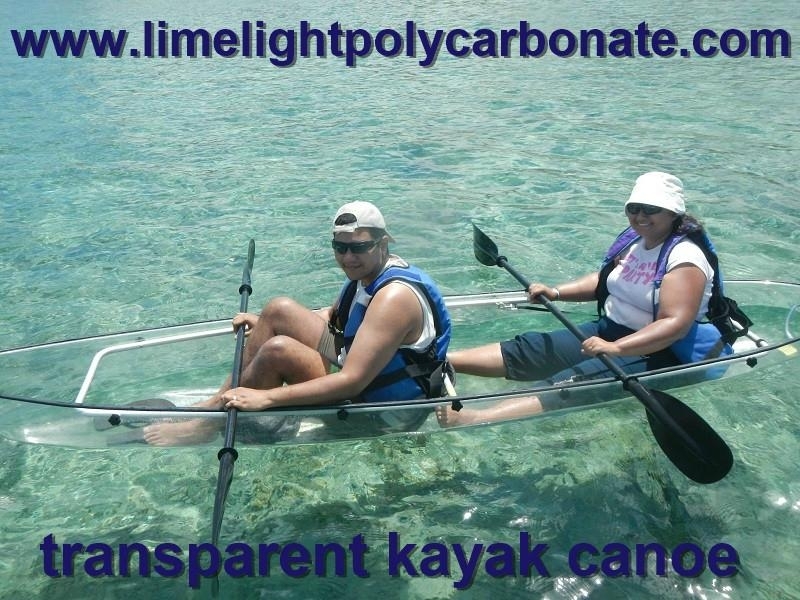 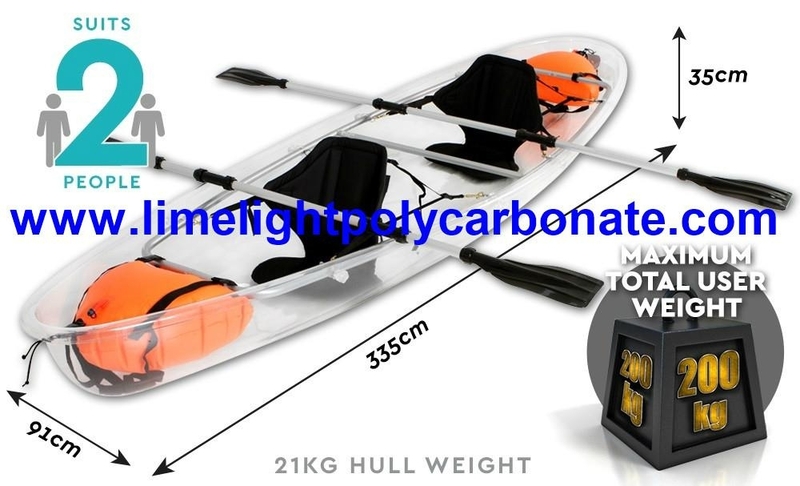 Polycarbonate kayak canoe, transparent polycarbonate kayak canoe, clear polycarbonate kayak canoe, transparent kayak canoe, clear kayak canoe, polycarbonate transparent kayak canoe, polycarbonate clear kayak canoe, pc kayak canoe, pc clear kayak canoe, clear pc kayak canoe, pc transparent kayak canoe, plastic kayak canoe, fishing kayak canoe, polycarbonate boat, transparent boat, clear boat, transparent polycarbonate boat, clear polycarbonate boat, polycarbonate transparent boat, polycarbonate clear boat, pc boat, clear pc boat, pc clear boat, pc transparent boat, pc clear boat, unbreakable kayak canoe, ocean kayak canoe, polycarbonate canoe, pc canoe, polycarbonate transparent canoe, pc transparent canoe, transparent polycarbonate canoe, transparent pc canoe, clear polycarbonate canoe, clear polycarbonate canoe, ocean canoe, unbreakable canoe, plastic canoe, fishing canoe, sport kayak, sport canoe, etc. 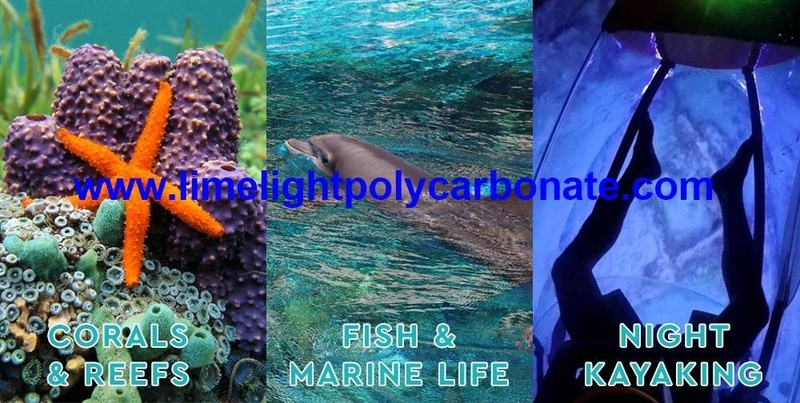 Payment Terms︰ T/T, L/C, Western Union, Cash, etc.